Shake up your meal planning routine with these 100 must try vegetarian spring recipes! 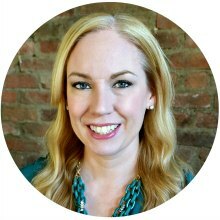 After blogging for over three years, I’ve created a lot of recipes! I was looking through my blog archives the other day for my Mexican Kale Salad, and I realized there were a lot of recipes that I hadn’t made in a long time. So I decided to roundup up 100 must try vegetarian spring recipes … all from my archives! Some are new, a lot are old, but all of them are delicious! 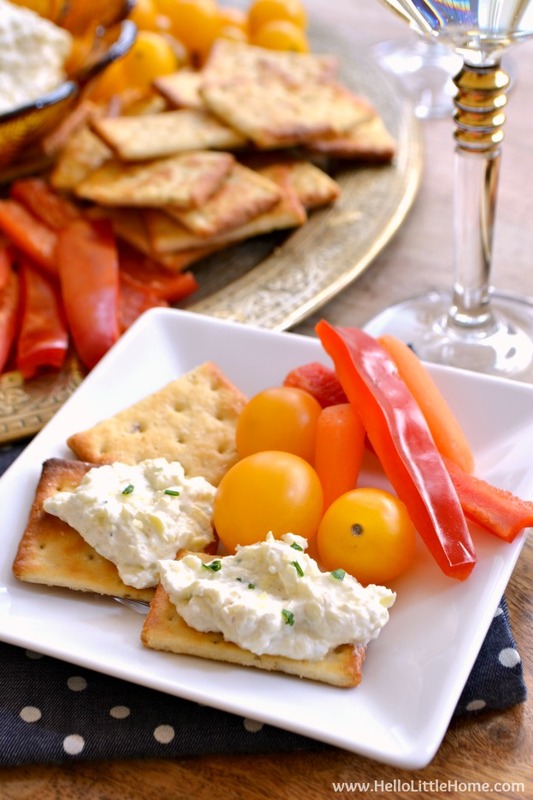 Everything is organized by recipe type (starting with appetizer and ending with desserts). If you are looking for something specific you can scroll right to that section. Enjoy! Creamy Lemon Artichoke Spread – The light, fresh flavors of this delicious spread are perfect for spring, especially when paired with your favorite white wine! 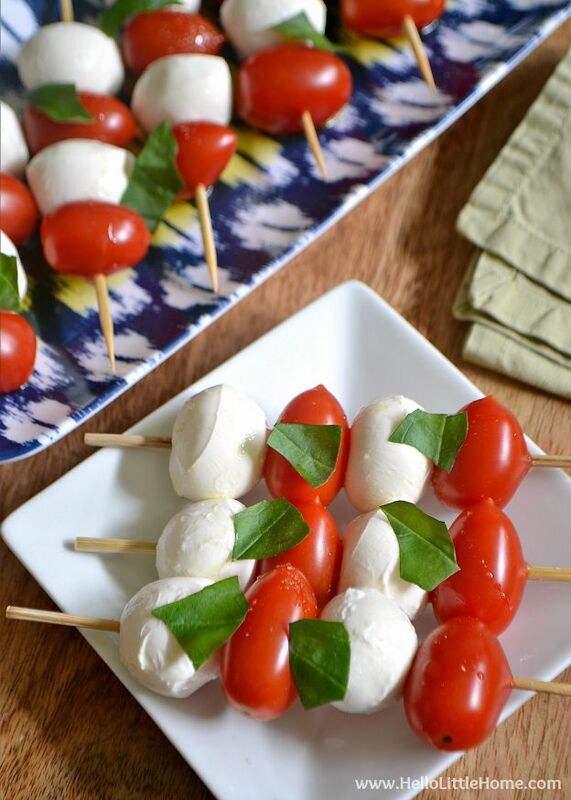 Caprese Salad Skewers – These skewers are beyond easy to make, and they taste super fresh and delicious! Serve them for a party or a light meal. 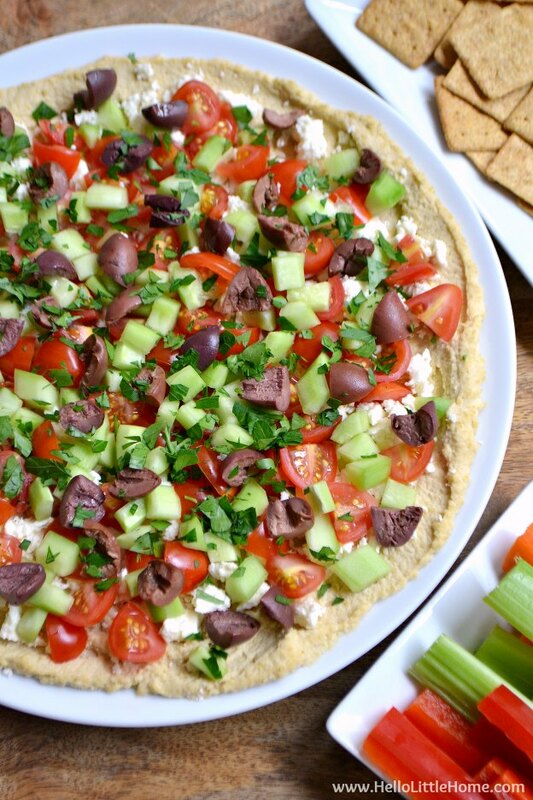 Layered Greek Hummus Dip – This flavorful dip is topped with fresh, delicious veggies! 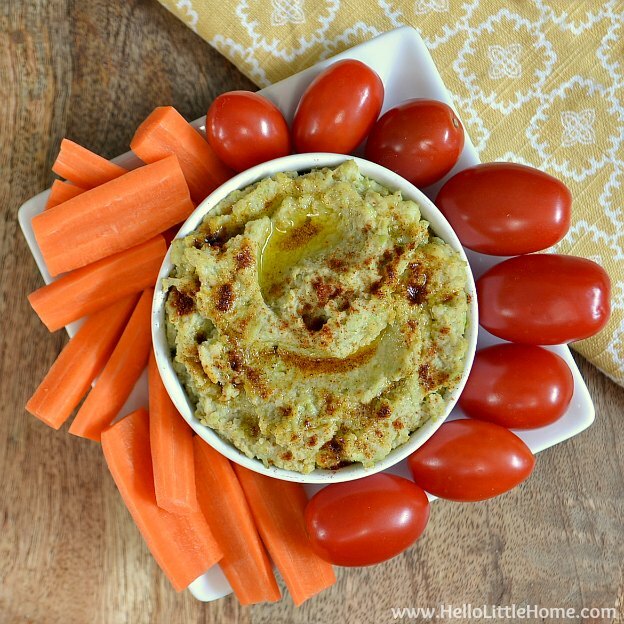 Lemon Garlic Edamame Dip – Whether you are looking for a healthy recipe to help you prepare for swimsuit season or just a yummy snack, give this delish dip a try! 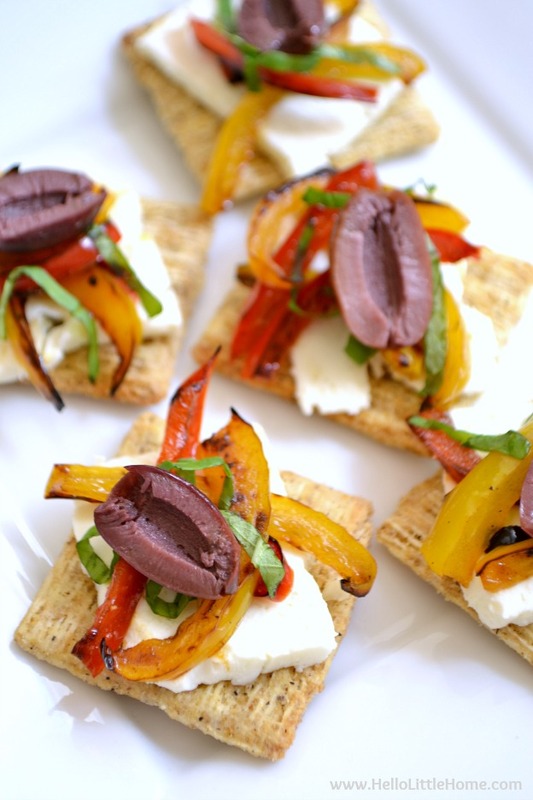 Feta, Pepper, and Olive Bites – These mini, bite-sized treats are perfect for spring entertaining! 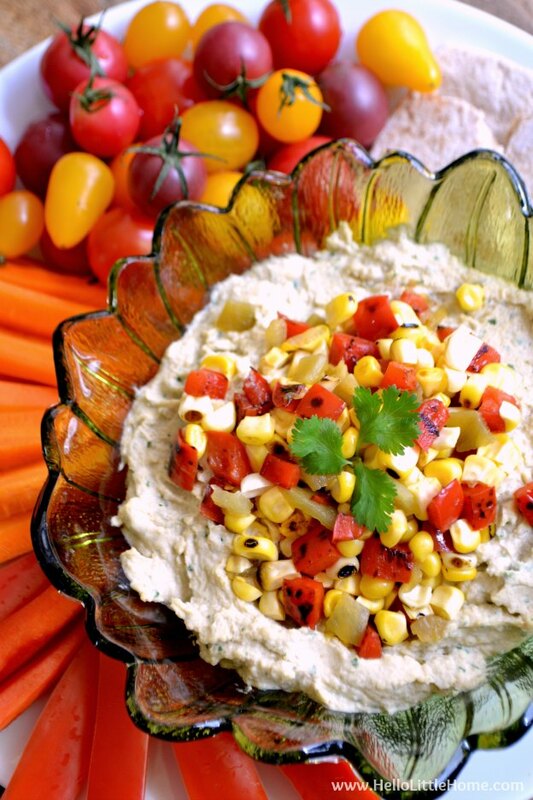 Southwestern Hummus with Spicy Corn Relish – Pair this spicy dip with your fave veggies, pita bread, and crackers for an easy spring appetizer. 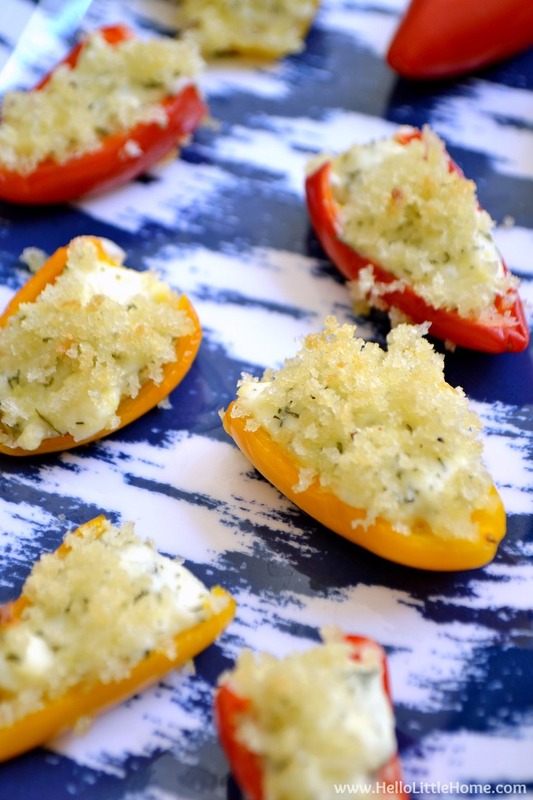 Feta Stuffed Mini Bell Peppers – So cute, and so delicious! These tasty stuffed peppers are packed with assertive flavors. 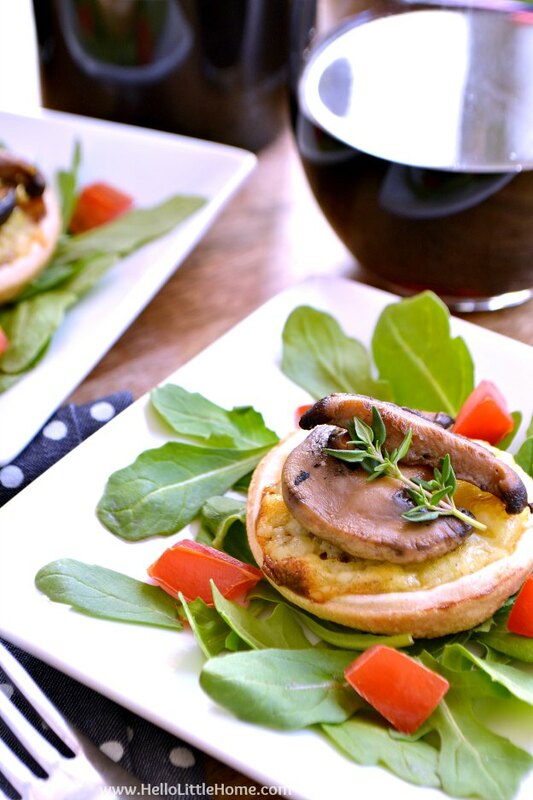 Mini Cheese Tarts with Pan Roasted Mushrooms – These delish mini tarts make an elegant spring appetizer. 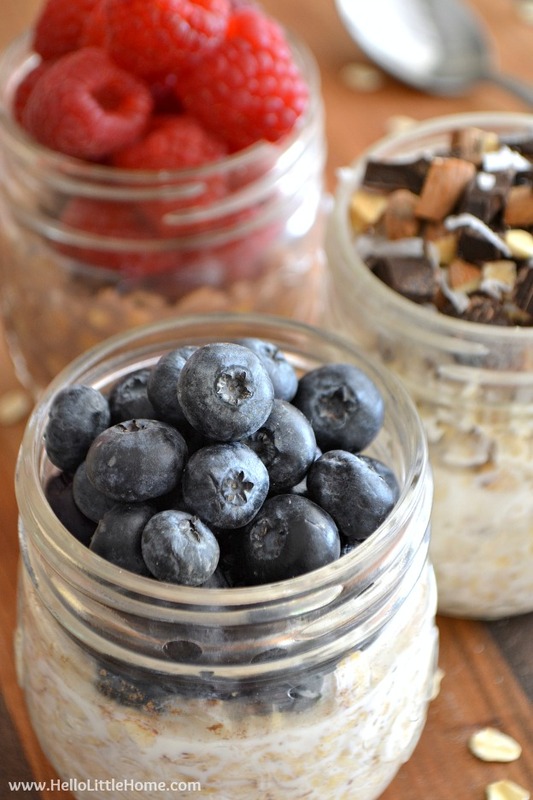 Easy Overnight Oats in a Jar – This easy recipe is perfect for busy spring days! 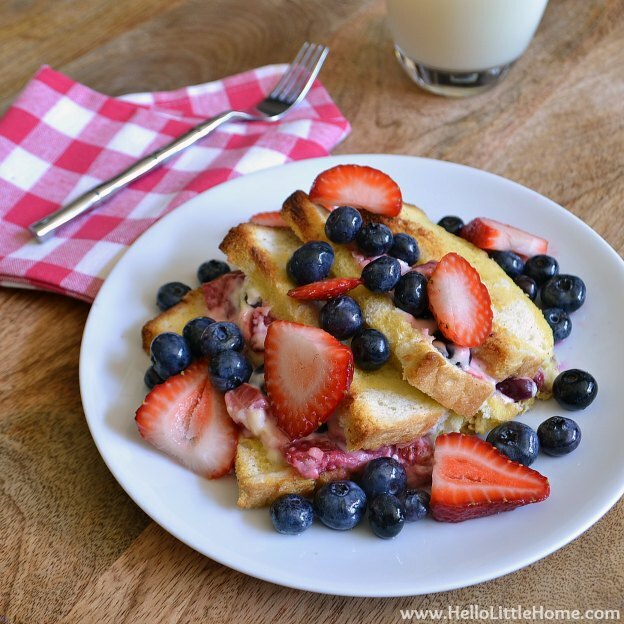 Berry Stuffed Baked French Toast – Berries + French Toast = hard to go wrong. 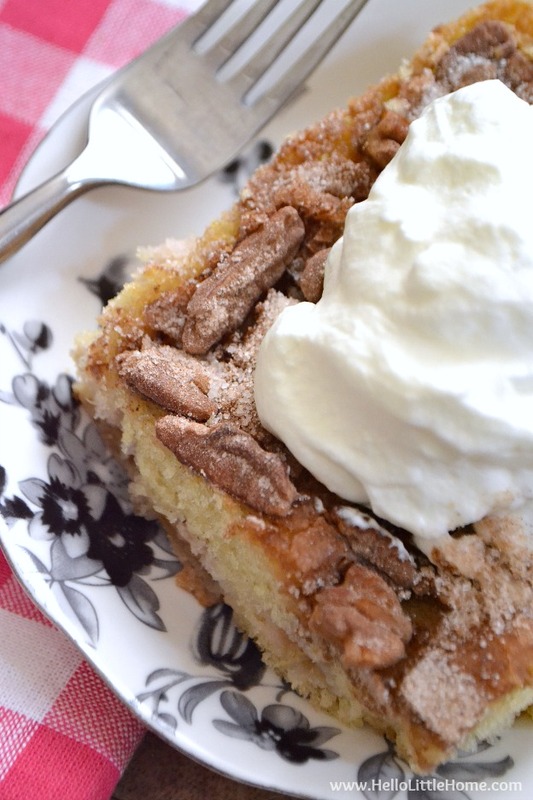 This recipe is perfect for a special morning. 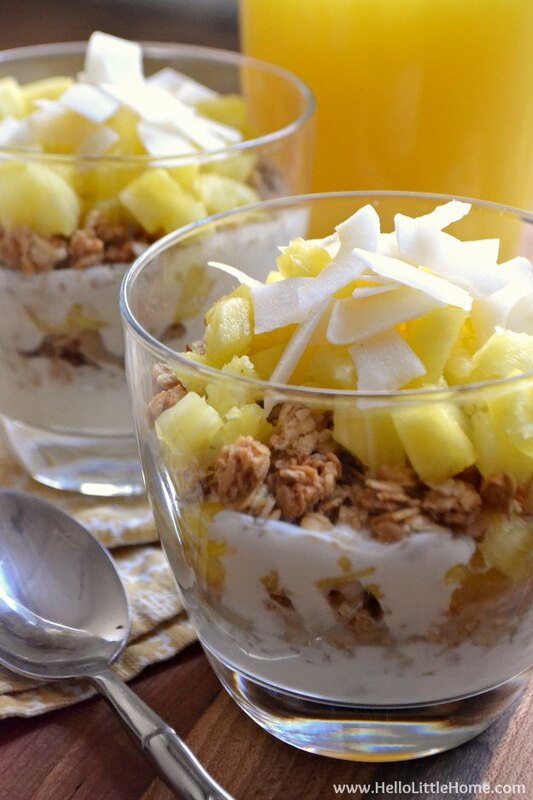 Tropical Breakfast Parfait – the bright, tropical flavors in this easy parfait recipe will transport you to your favorite island! 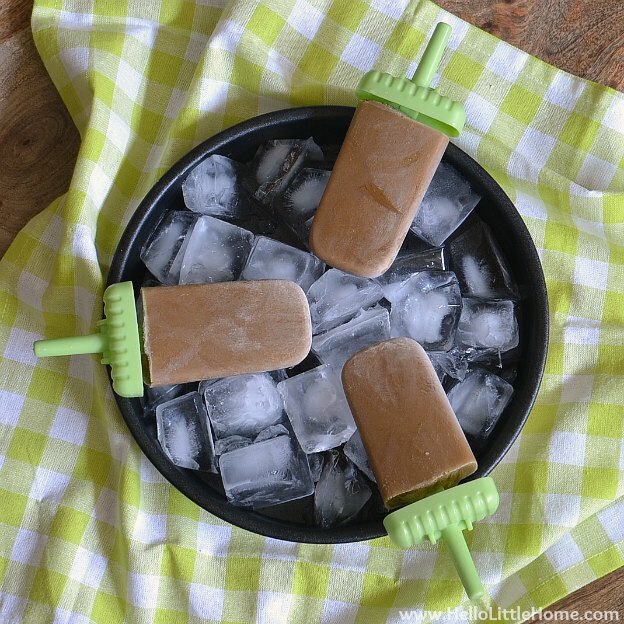 Coconut Milk Iced Coffee Popsicles – These vegan popsicles are the perfect pick-me-up on a warm spring morning! 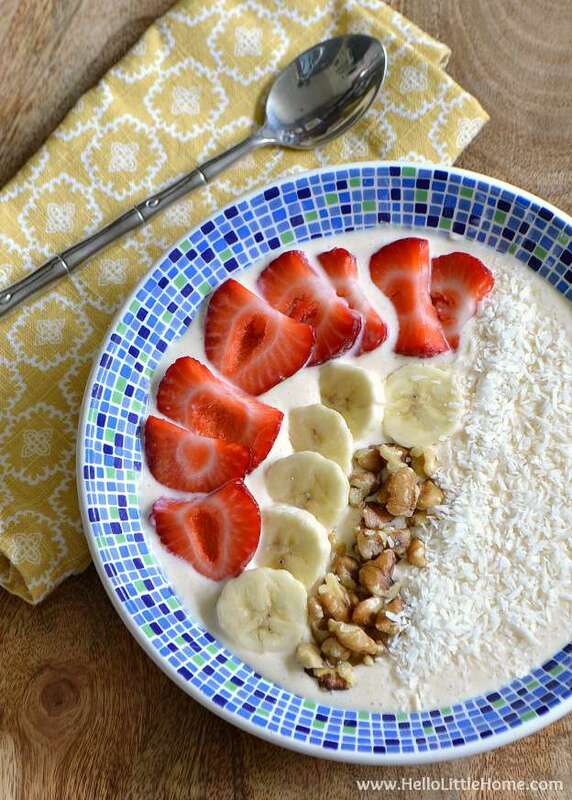 Easy Smoothie Bowl Recipe – This smoothie bowl looks so pretty! Make this tasty bowl with your favorite spring berries. 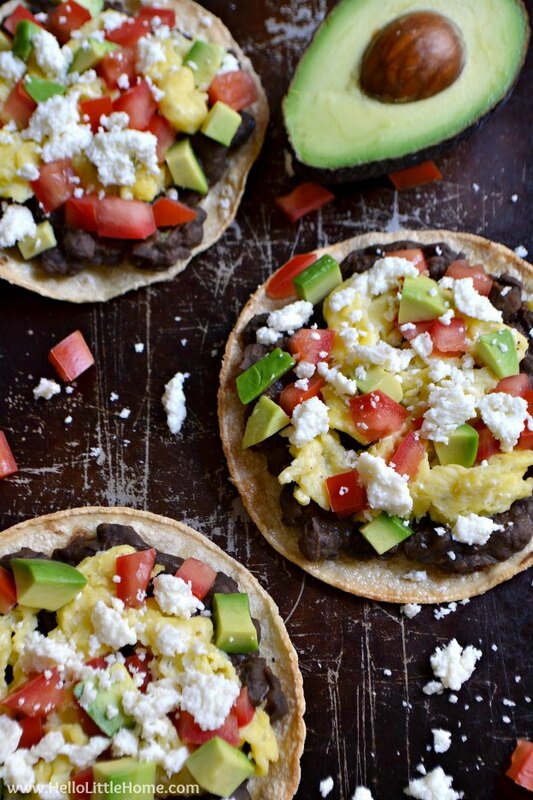 Mexican Breakfast Tostadas – Light and healthy, these easy tostadas are a recipe your whole family will love! 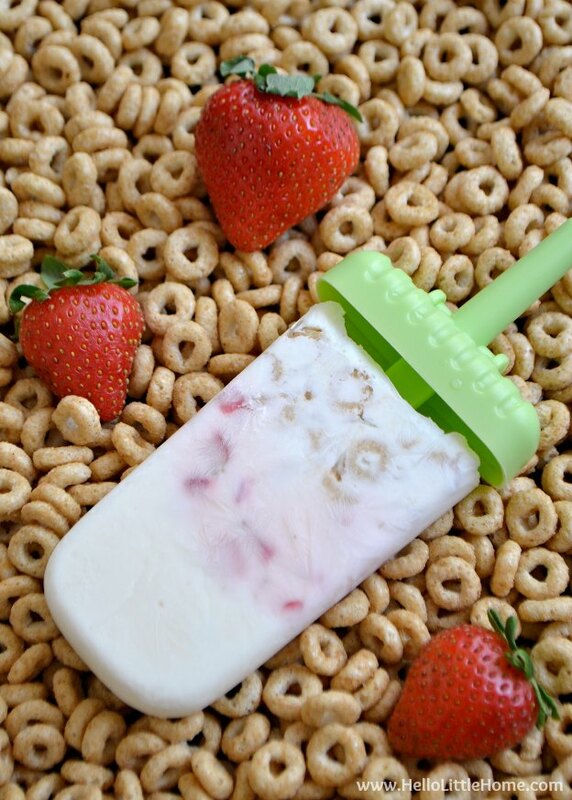 Breakfast Cereal Popsicles – Treat yourself to these tasty popsicles on a warm spring day! 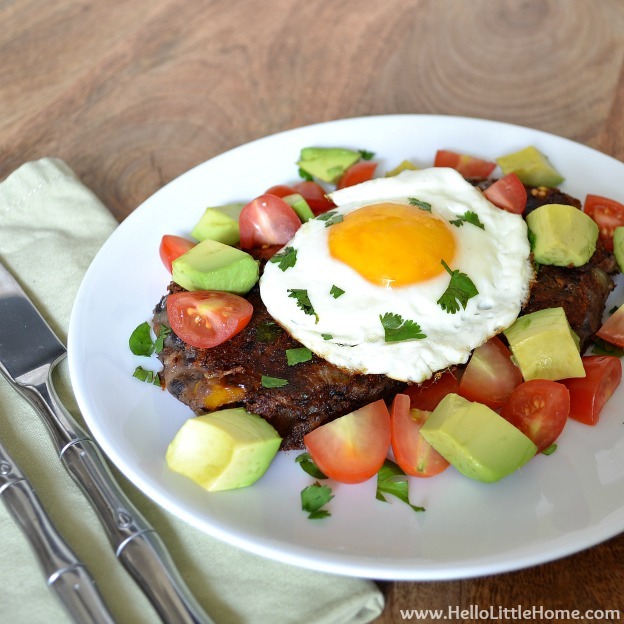 Spicy Black Bean Cakes with Egg, Avocado, and Tomato – Not strictly for breakfast, these delicious cakes would be perfect for breakfast, lunch, or dinner. Yum! 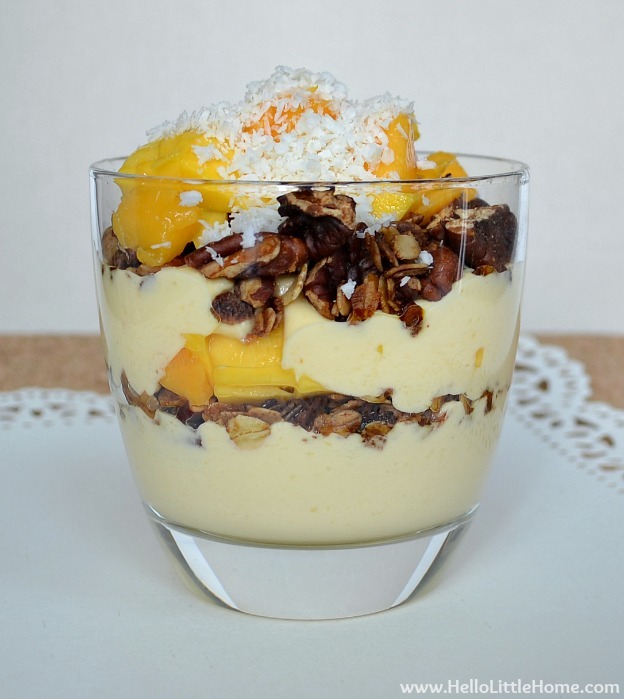 Mango Yogurt Breakfast Parfait – The light, tasty flavors in this yummy parfait will be loved by your whole family! 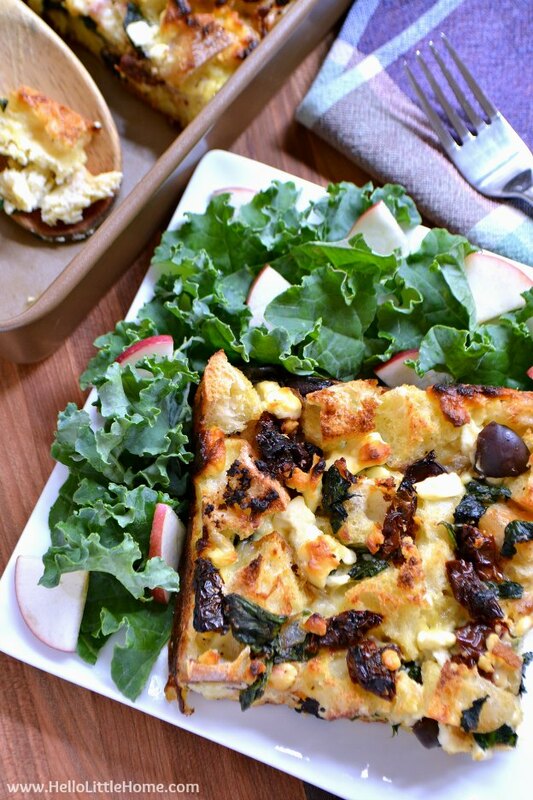 Mediterranean Strata with Olives, Sundried Tomatoes, and Feta – Pair this delish dish with fresh fruit for the perfect spring brunch! 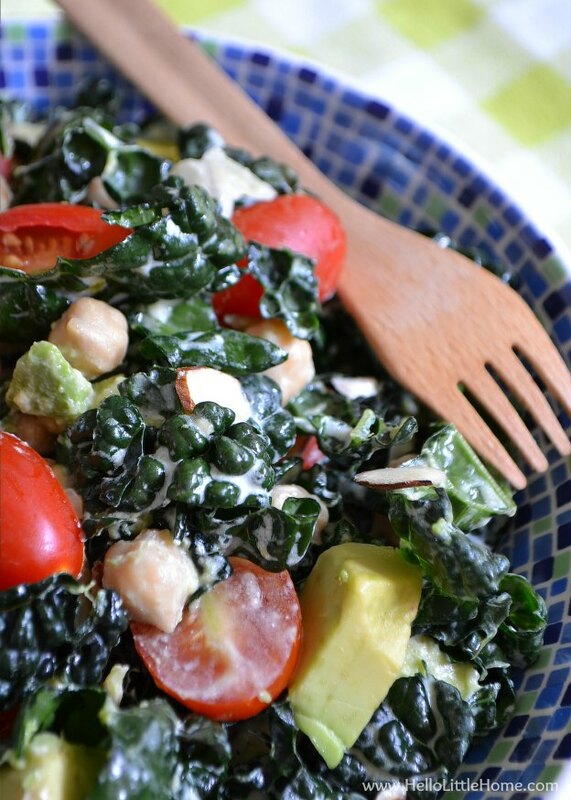 Easy Kale Salad with Creamy Lemon Garlic Dressing – A hearty, yet healthy kale salad is the perfect spring recipe. 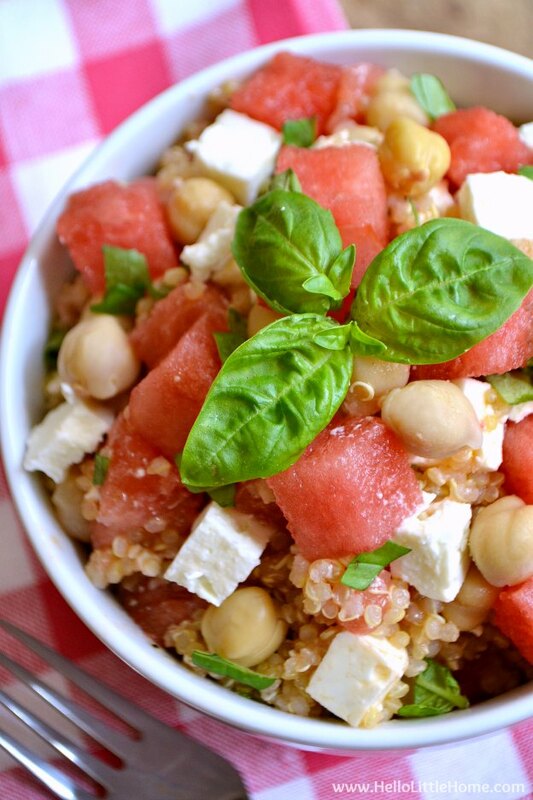 Watermelon Basil Quinoa Salad – This unique, refreshing salad is an all-time favorite! 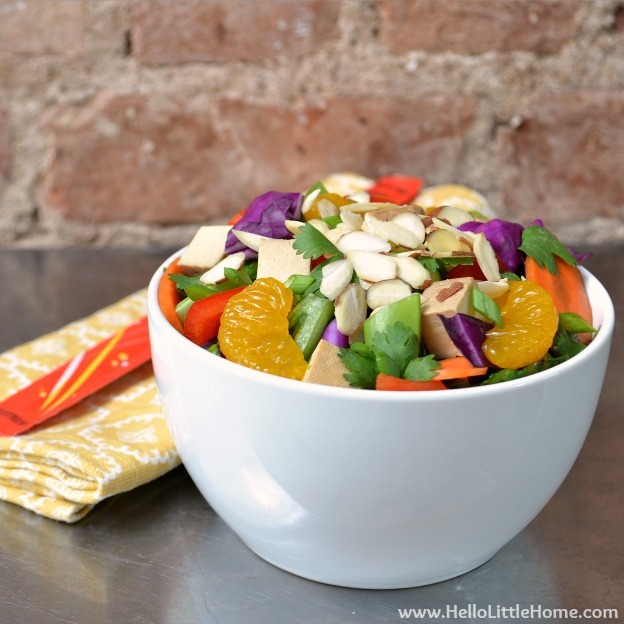 Chinese Chopped Salad – This tasty salad is positively packed with fresh veggies and zesty flavors! 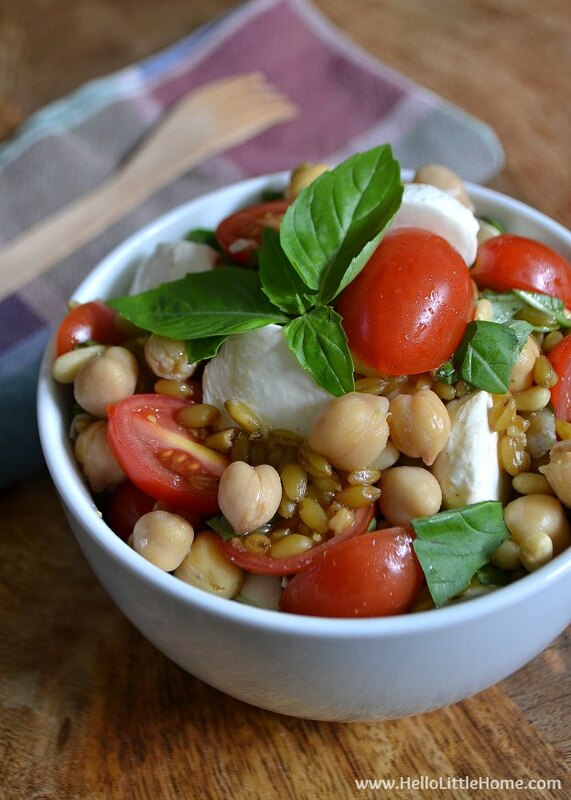 Tomato, Basil, and Mozzarella Freekeh Salad – Yum! This salad is filled with my favorite summer flavors, and it’s the perfect excuse to try a relatively unknown grain (that’s super delicious btw!). 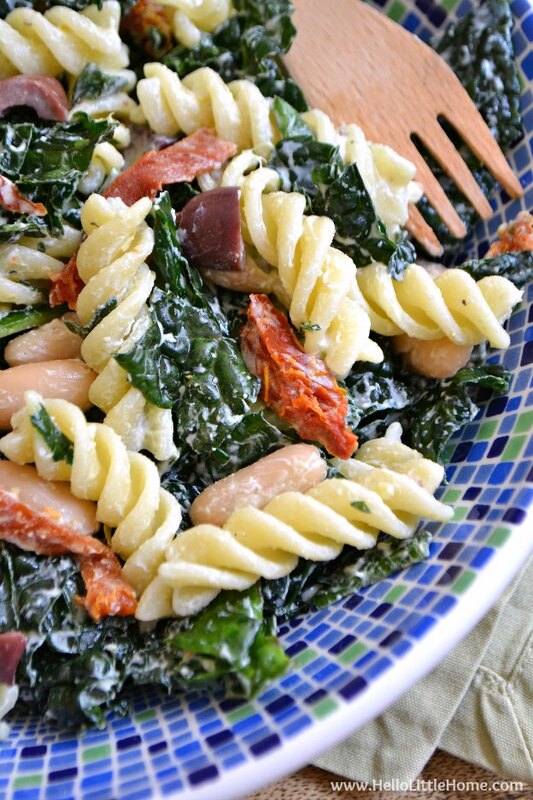 Kale Pasta Salad with Creamy Lemon Basil Dressing – Like your fave pasta salad with a healthy kale boost! 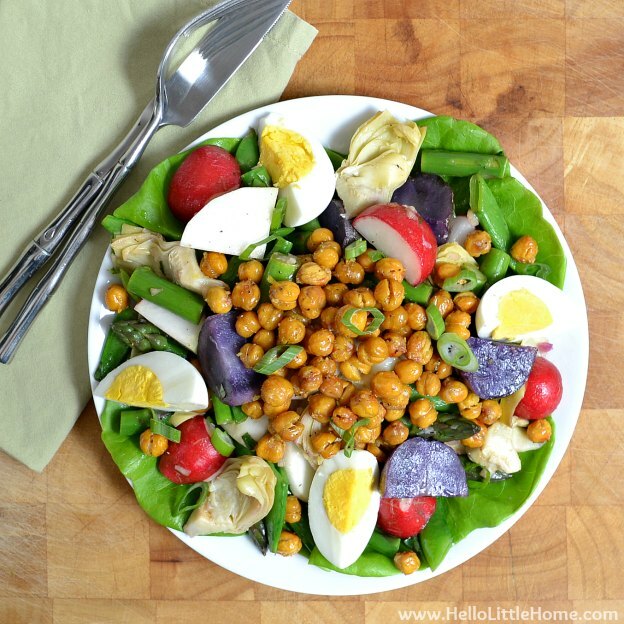 Spring Vegetable Salad with Lemon Vinaigrette and Roasted Chickpeas – This salad is fresh, zesty, filled with tons of veggies, and topped with crunchy roasted chickpeas. So good! 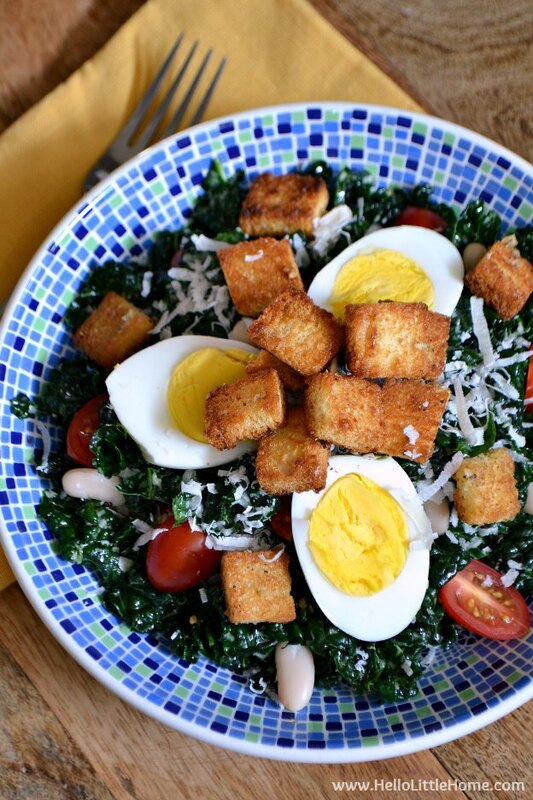 Kale Caesar Salad – A fun twist on the classic salad, this recipe is perfect for a spring lunch or dinner. 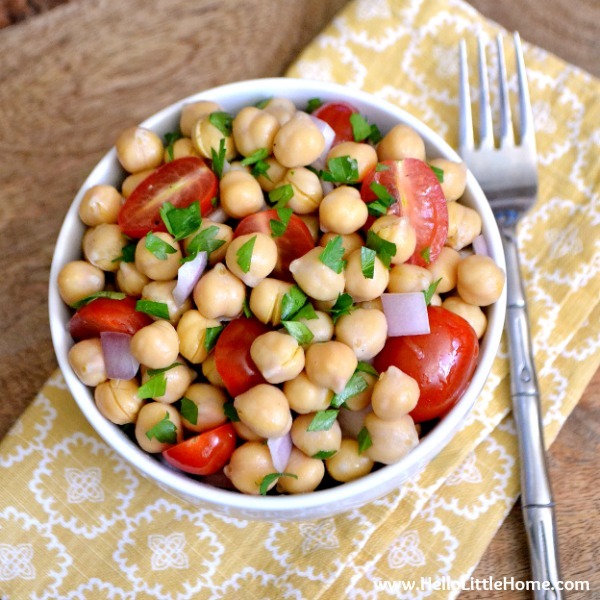 Lemony Chickpea Salad – Inspired by a dish from a favorite restaurant, this salad is one of my fave spring recipes. Simple, yet so delicious! 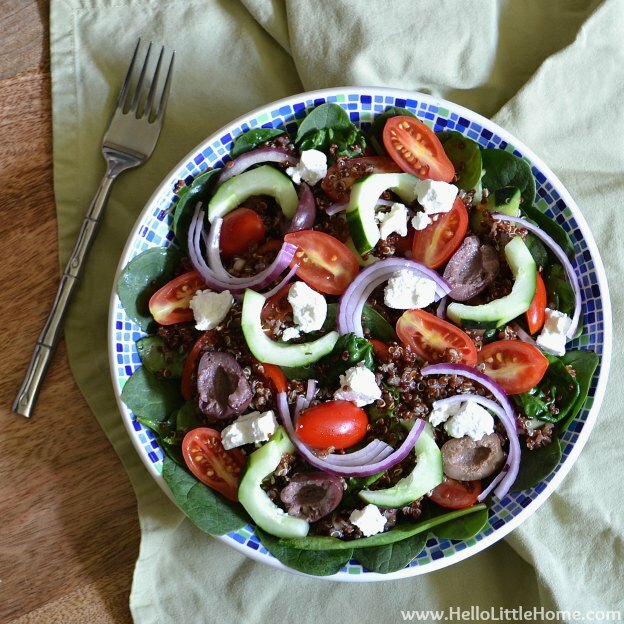 Greek Quinoa Salad – This hearty salad is filled with bold, Greek flavors you’ll love! 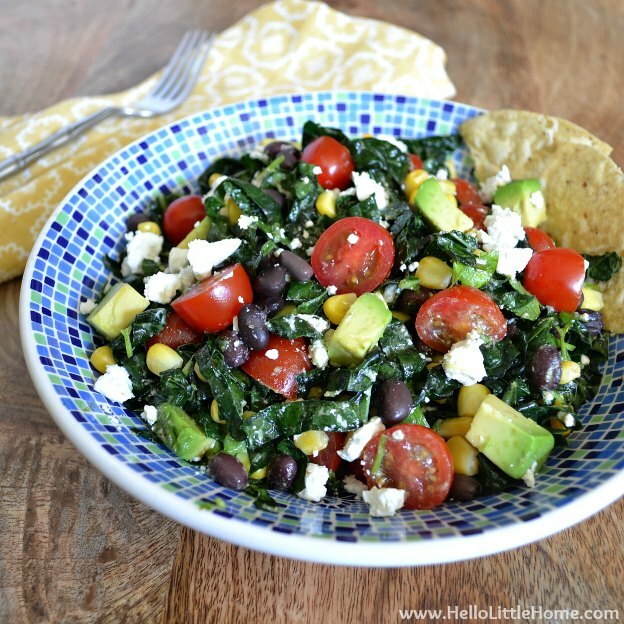 Mexican Kale Salad with Chili-Lime Vinaigrette – Filled with healthy ingredients, this salad is also super tasty, and the sweet-spicy vinaigrette is amazing. 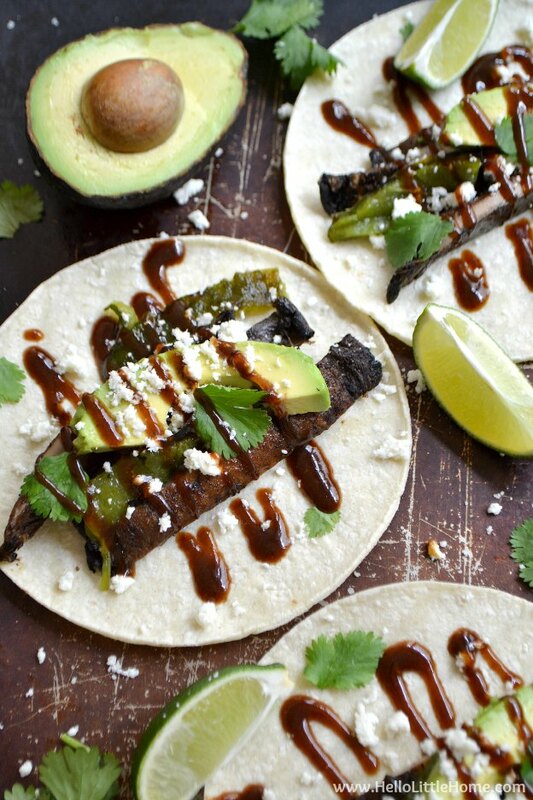 Grilled Portabella Poblano Tacos with Sweet and Spicy BBQ Sauce – Break out the grill for the season and make these yummy tacos! 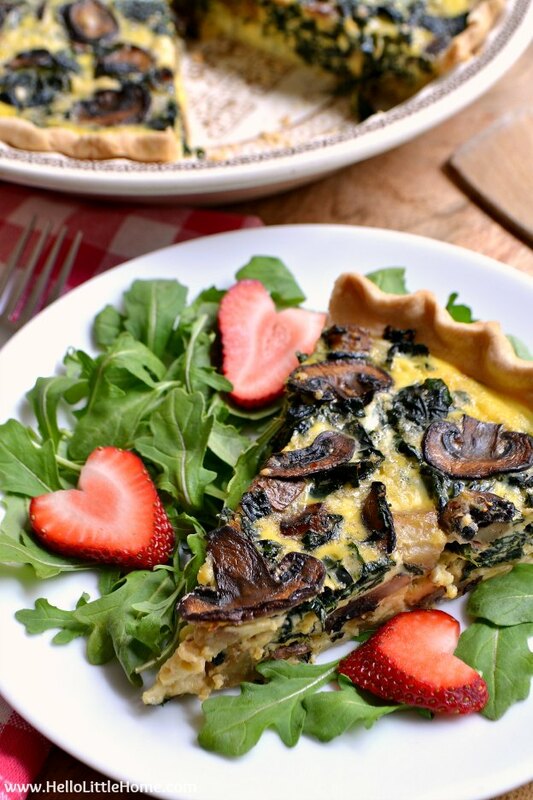 Kale, Mushroom, and Cheddar Quiche – Serve this mouthwatering recipe for Easter, brunch, or any meal! Easy 15 Minute Tomato Basil Pasta – So good and so easy … this often-repeated recipe was inspired by a dish at my fave Italian restaurant! 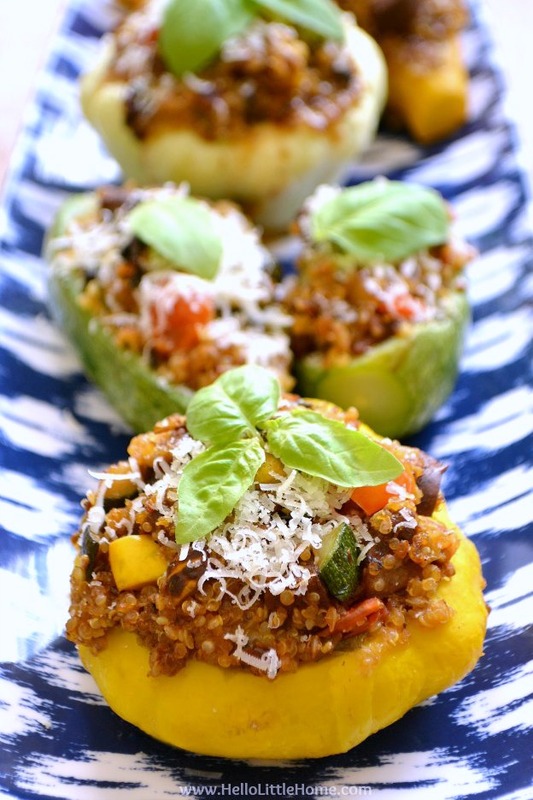 Vegetarian Quinoa and Sausage Stuffed Summer Squash – Pair this yummy recipe with a salad for a delish seasonal meal. Banh Mi Bowl with Vietnamese Peanut Sauce – A fun, colorful twist on the classic sandwich that’s super delicious! 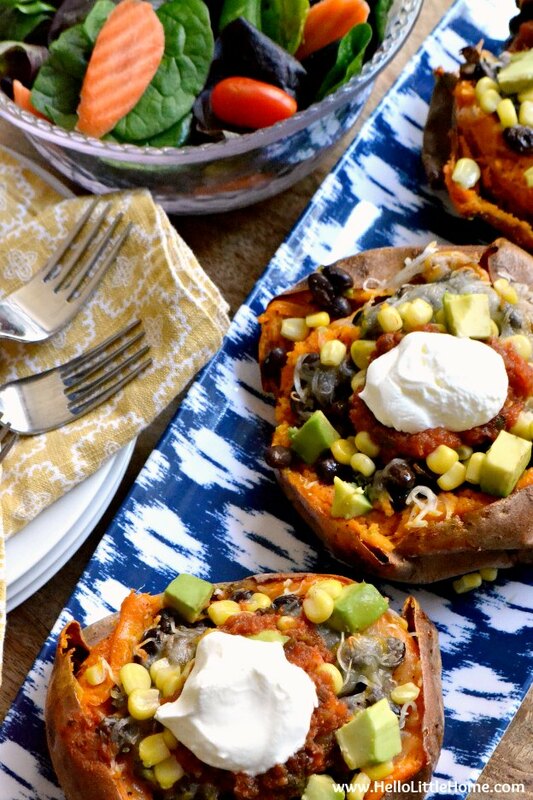 Tex Mex Stuffed Sweet Potatoes – These tasty potatoes are easy to make … great for busy spring evenings. Customize the recipe with your favorite toppings. 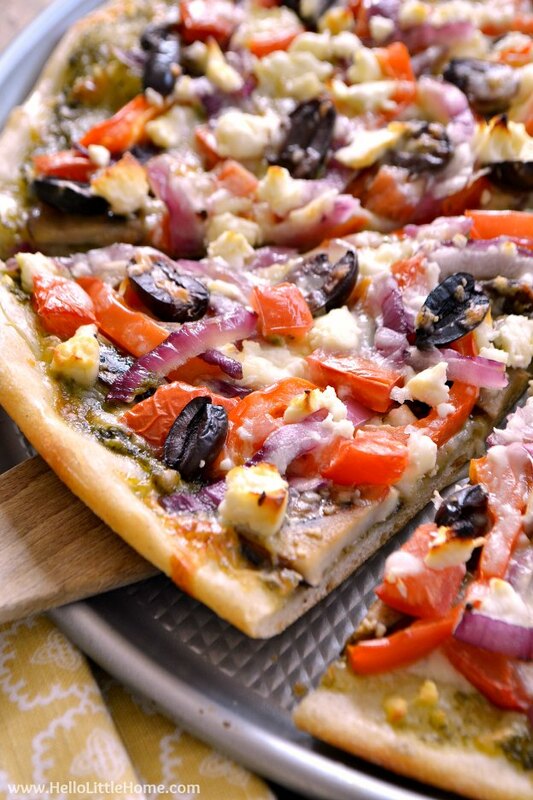 Pesto, Feta, and Veggie Pizza – This yummy pizza is loaded with impossible to resist flavors! 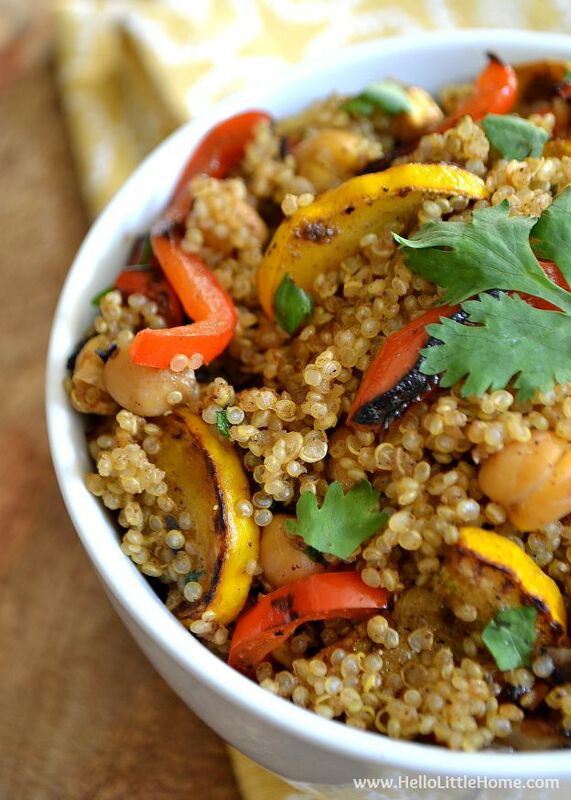 Curried Veggie, Chickpea, and Quinoa Stir Fry – Try this flavor packed recipe on a busy weeknight! 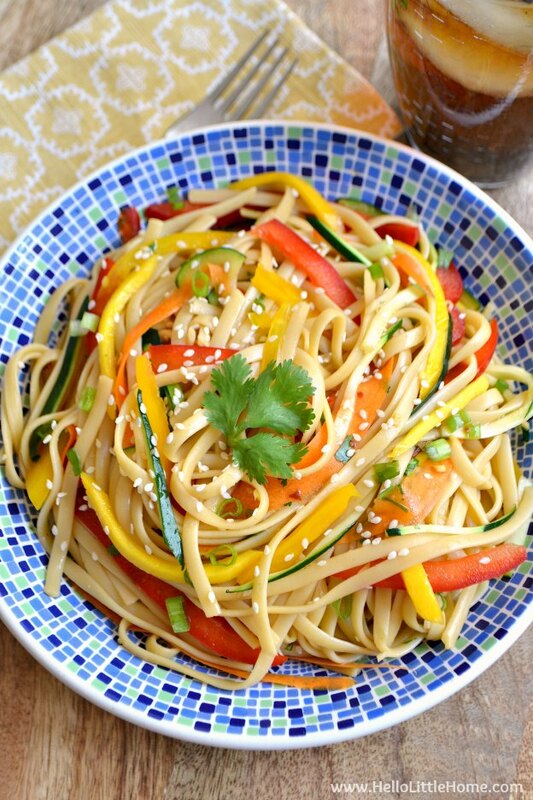 Cold Asian Noodle Salad – This fresh, flavorful salad is perfect for warm spring nights. 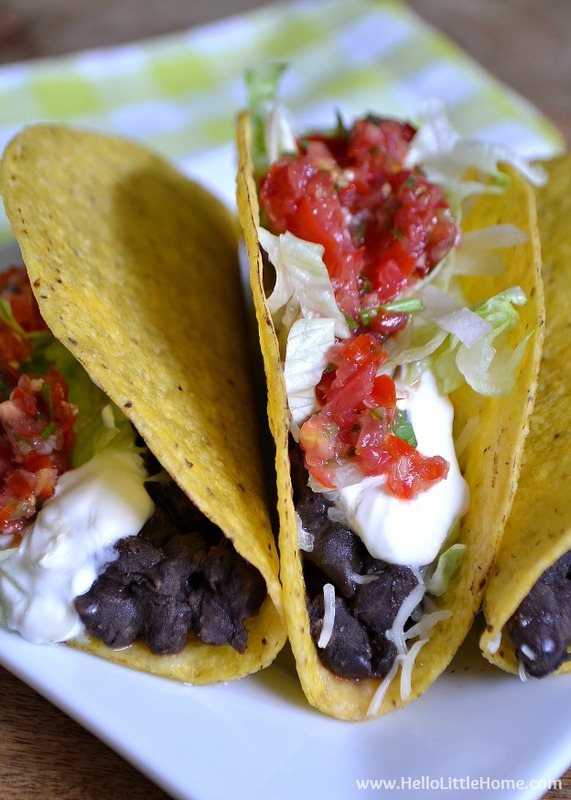 Crunchy Black Bean Tacos with Fresh Salsa – These quick tacos are perfect for Taco Tuesday or Cinco de Mayo. 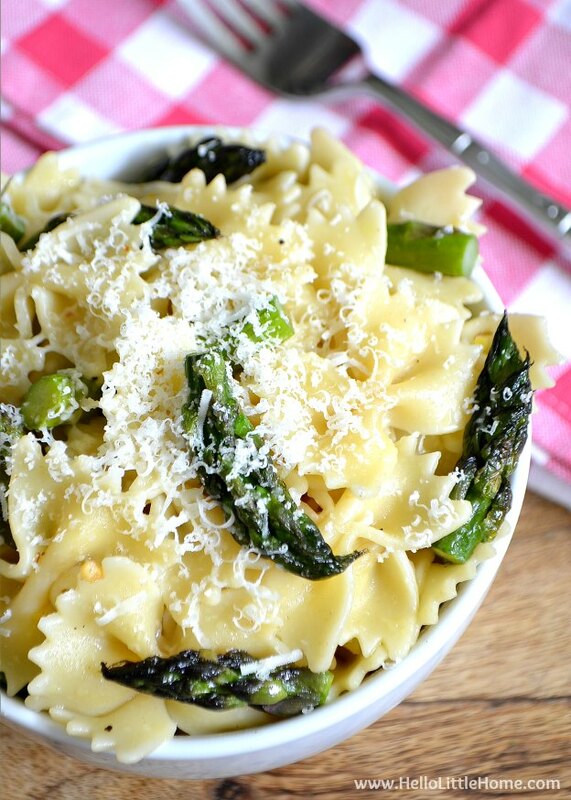 Farfalle with Roasted Asparagus, Lemon, and Parmesan – Simply delicious! I’ve made this recipe so many times over the years, and it never gets old. 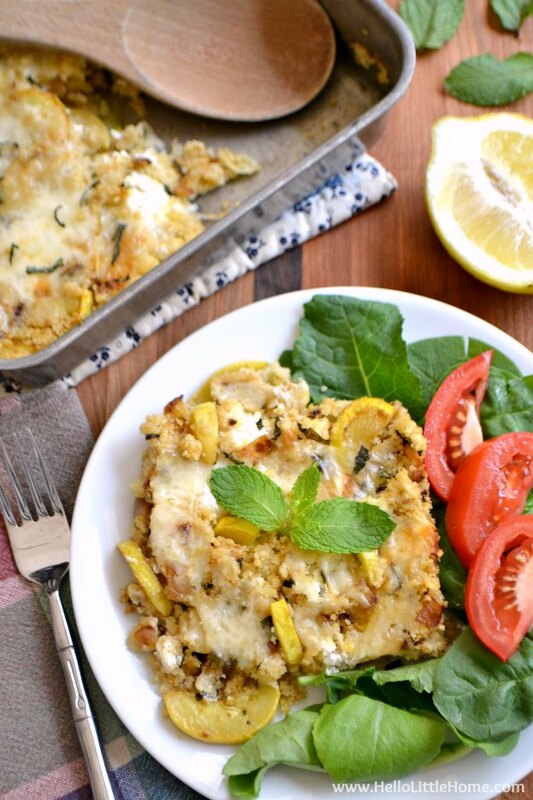 Zucchini, Mint, and Goat Cheese Couscous Casserole – Treat your family to this cheesy, yet healthy and delicious baked dish. 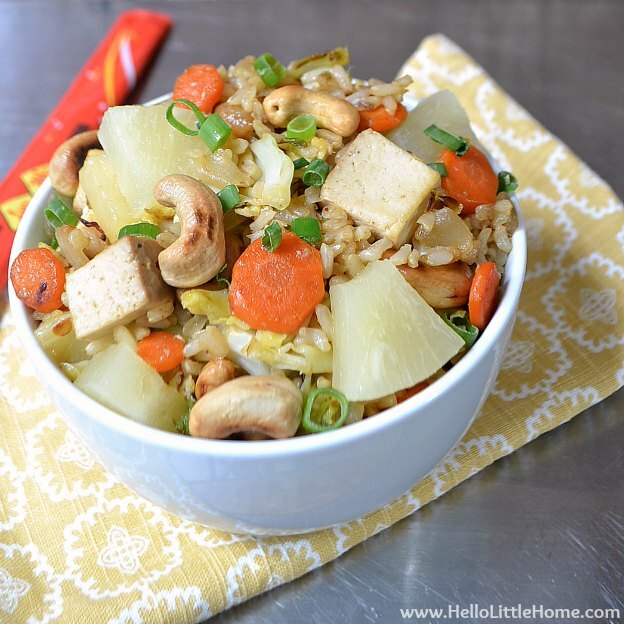 Pineapple Fried Brown Rice – This is a delicious knock off a favorite takeout recipe! 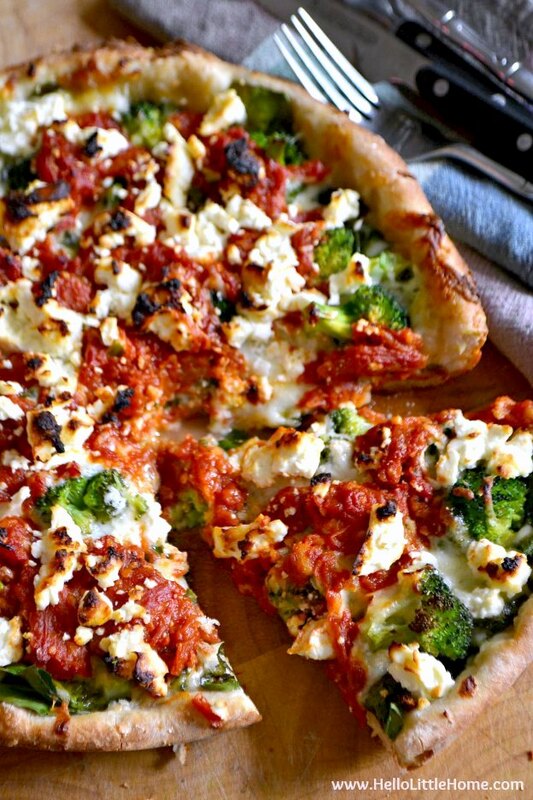 Homemade Deep Dish Pizza with Broccoli, Spinach, and Feta – This recipe is perfect for those cold spring days when you’re craving veggies, but still want something warm and hearty. 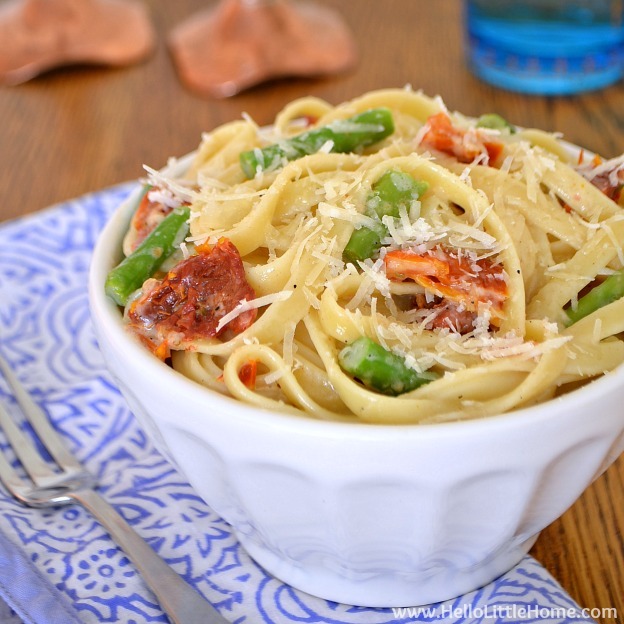 Fettuccine Alfredo with Asparagus and Sundried Tomatoes – Showcase the season’s fresh asparagus in this decadent, creamy pasta recipe. 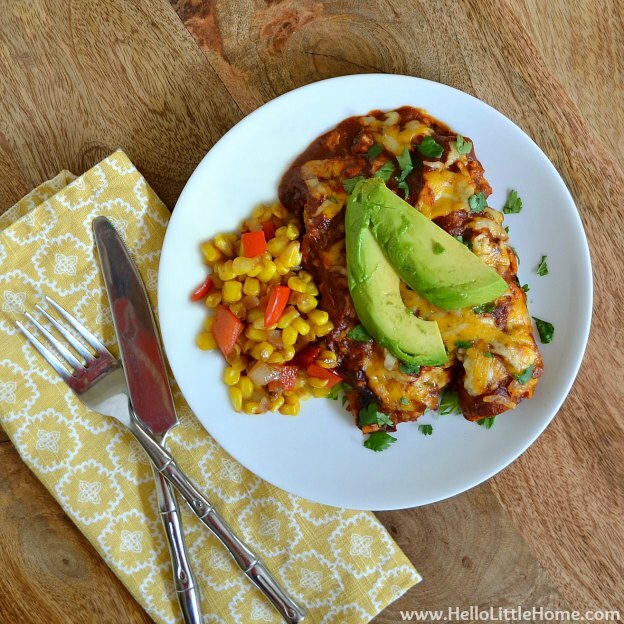 Black Bean and Cream Cheese Enchiladas – These creamy enchiladas are an all-time favorite recipe … serve them for Cinco de Mayo or any night of the week! 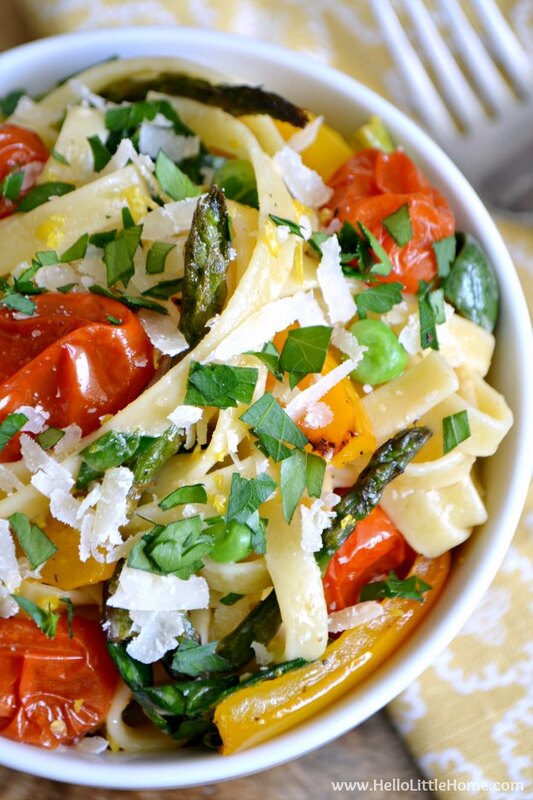 Lemony Pasta Primavera with Roasted Vegetables – Mmm, this pasta is so amazing! 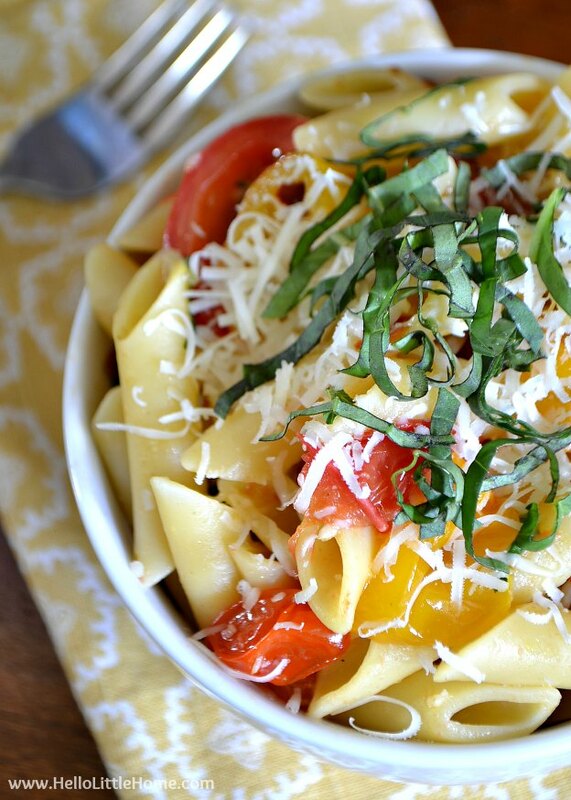 Plus, it’s filled with tons of veggies, so you can feel better about the carbs! 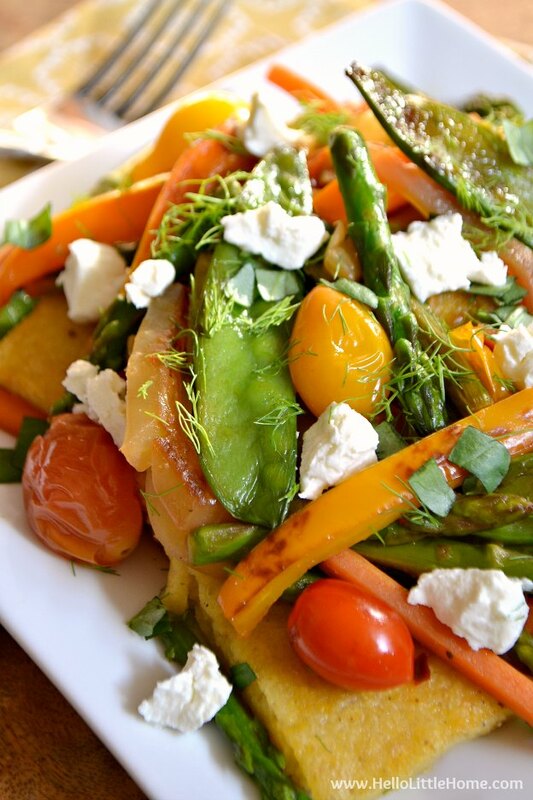 Polenta Cakes with Stir-Fried Spring Vegetables – This meal is a showstopper! Perfect for serving to company, this tasty dish is filled with fresh spring flavors. 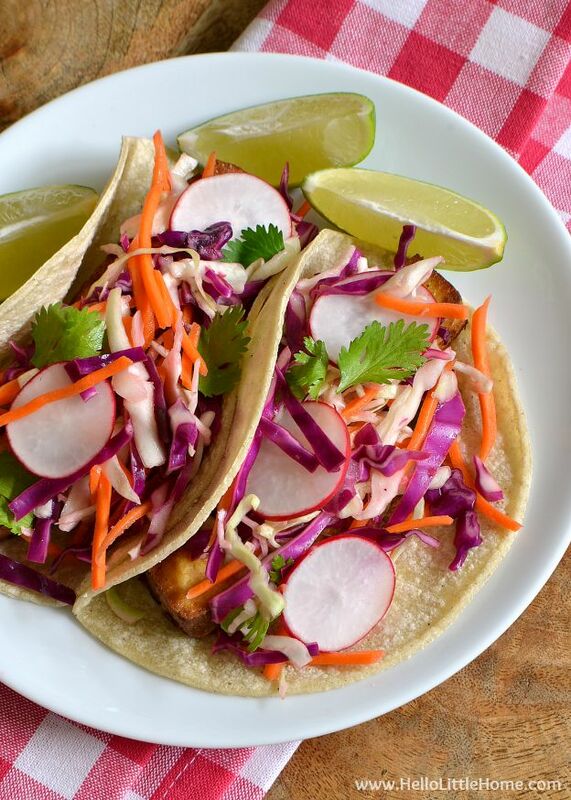 Quick Tofu Tacos with Crunchy Veggie Slaw – These delish tacos super easy to make + taste amazing. 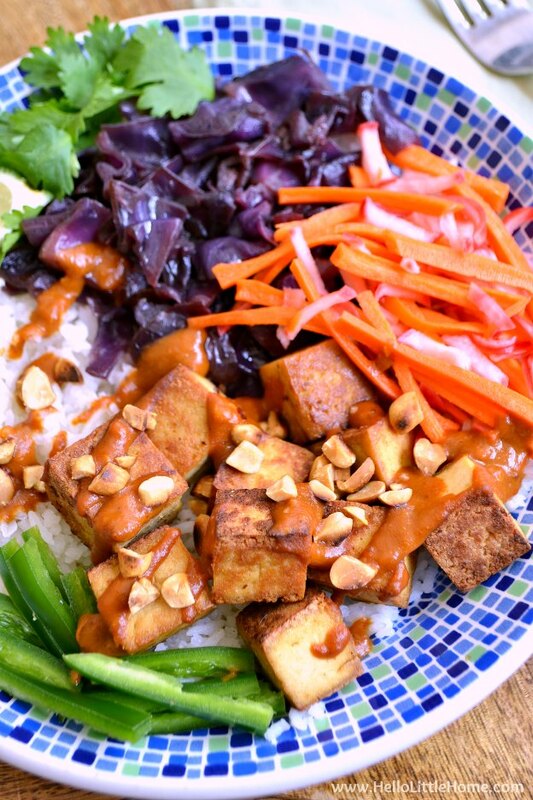 This is a great recipe to try if you’re afraid you won’t like tofu. 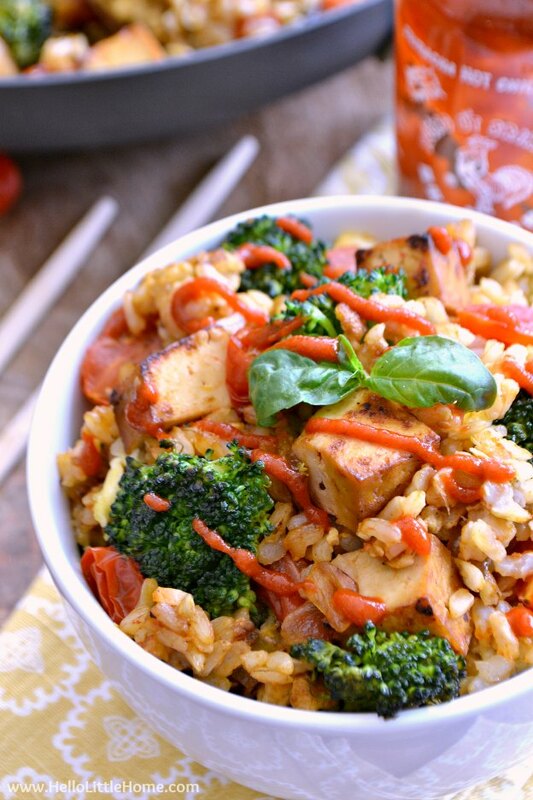 Spicy Tomato Basil Fried Rice – Don’t let the photo scare you off (I really need to reshoot this recipe soon!) … this is one delicious recipe! It’s perfect for busy week nights, especially if you have leftover rice. 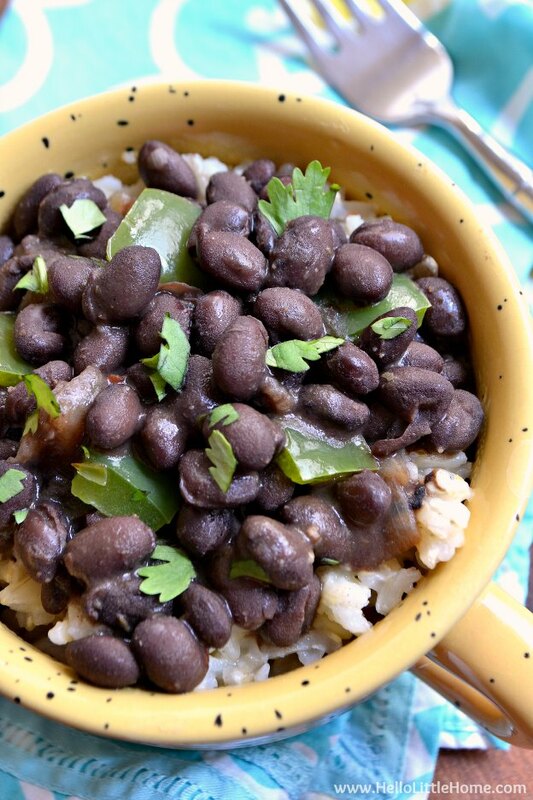 Black Beans and Rice – This super quick, delicious recipe is perfect for busy weeknights. 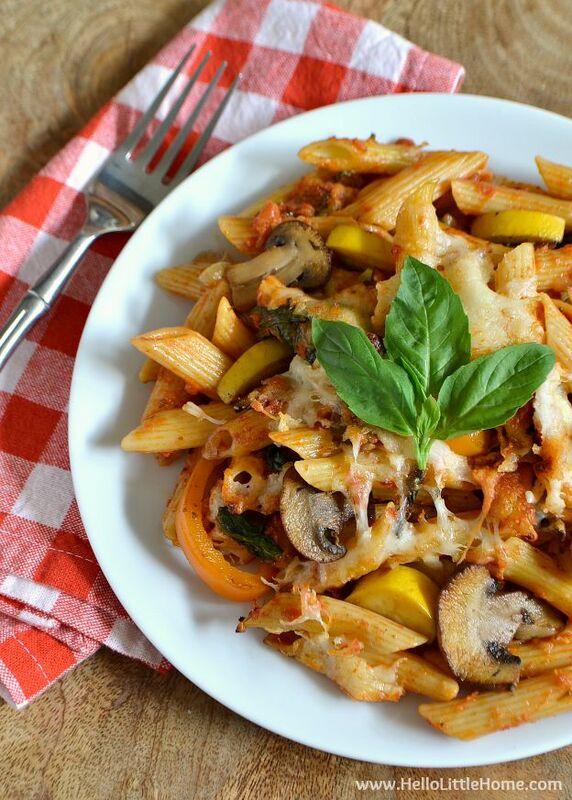 Cheesy Veggie Pasta Bake – A filling, vegetable packed recipe that will warm you up on cool spring nights. 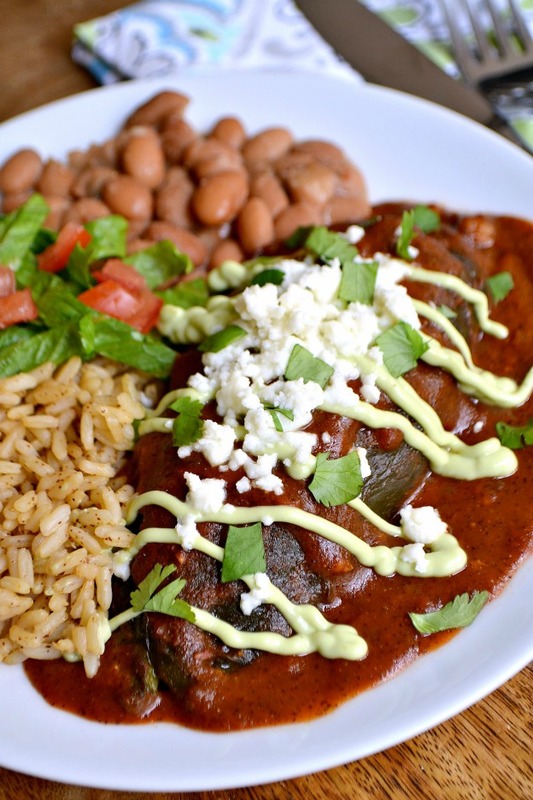 Veggie Stuffed Chiles Rellenos with Avocado Cream – A show-stopping recipe that’s perfect for Cinco de Mayo! 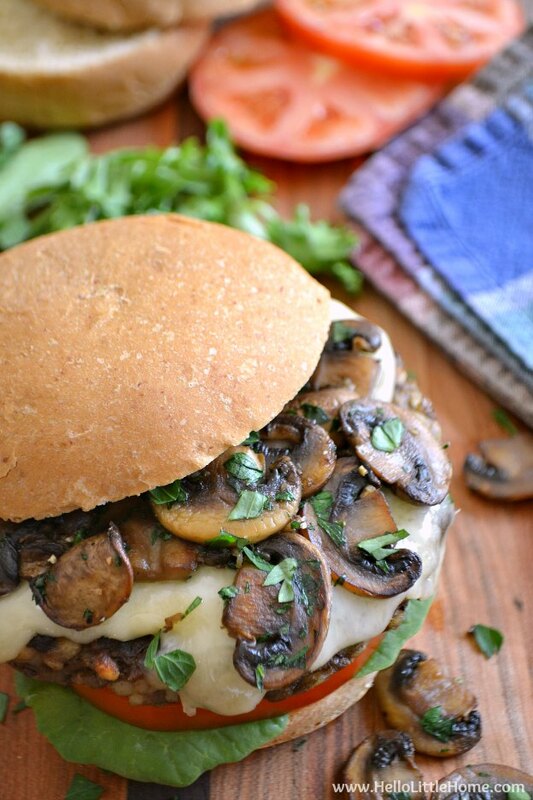 Mushroom Swiss Veggie Burgers – A cheesy, delicious burger recipe that you’re going to love! 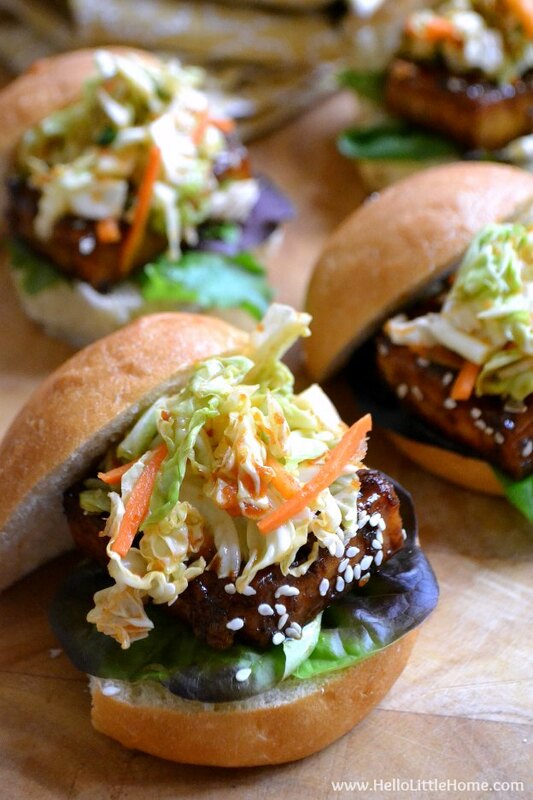 Korean BBQ Tofu Sliders with Kimchi Slaw – The bold flavors in these tasty sliders will wake you up after a long winter! 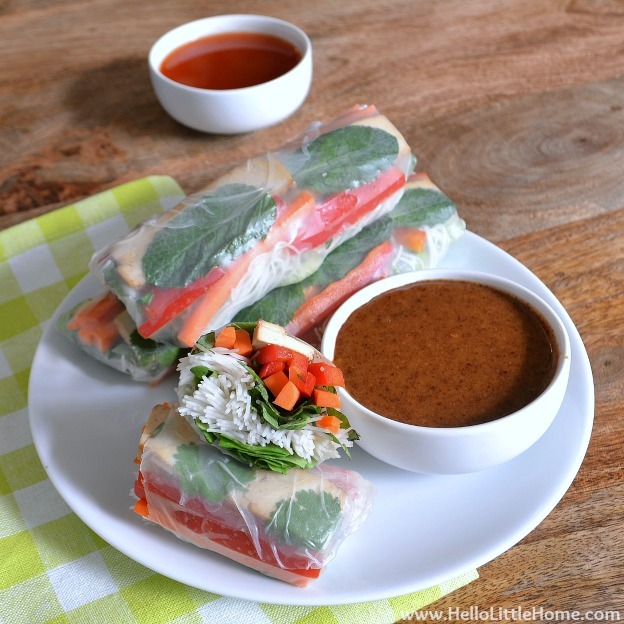 Crunchy Vegetable Wraps with Peanut Coconut Dipping Sauce – I love these light, healthy wraps! Perfect for warm spring days. 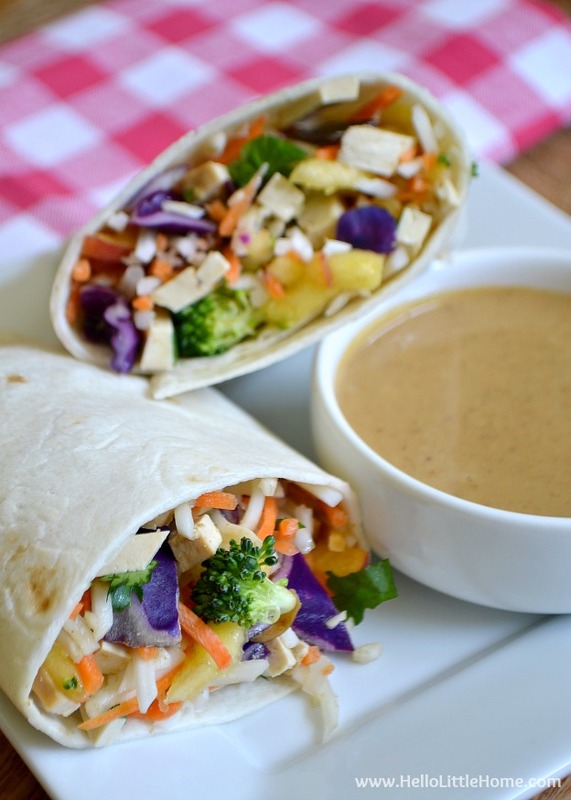 You’re going to love that peanut sauce! 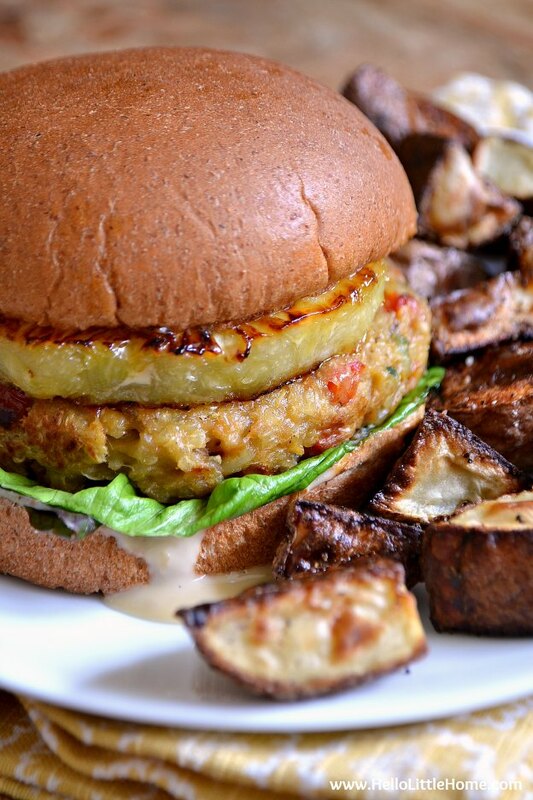 Vegetarian Teriyaki Burgers – Let the tropical flavors transport you to a warmer climate (if only in your dreams)! 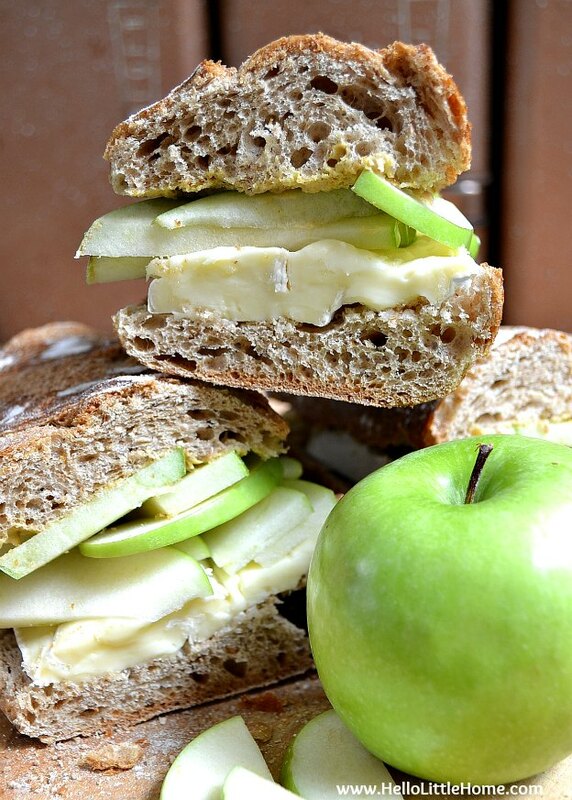 Brie and Apple Sandwich – Pack this sumptuous sandwich for your first spring picnic! 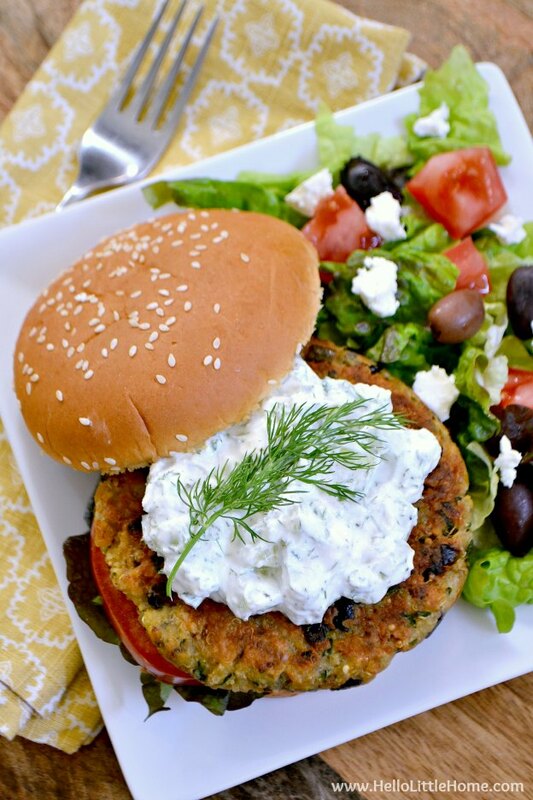 Greek Veggie Burgers with Cucumber Feta Sauce – If you love a Greek Salad, then you are going to adore these flavor-filled burgers! They are so tasty. 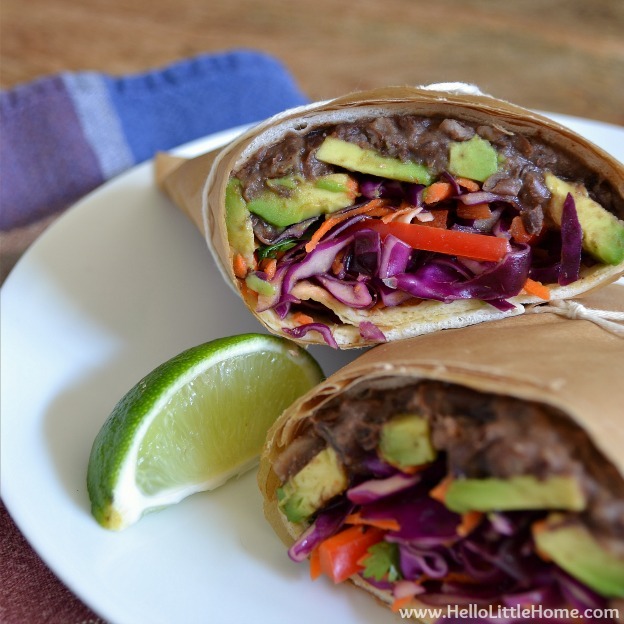 Mexican Black Bean Wrap with Avocado and Tri-Color Slaw – So good! 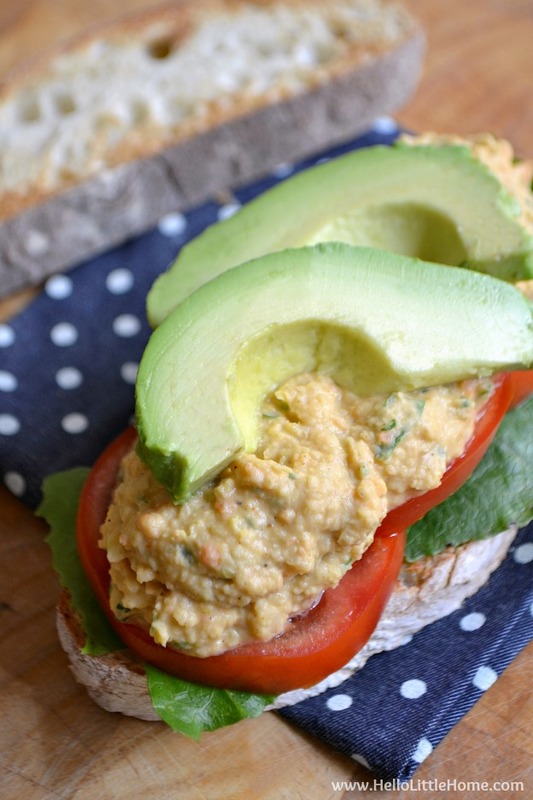 This healthy sandwich is filled with crunchy veggies, and it’s super delicious. Enjoy it now and all the way through summer! Spicy Chickpea Salad Sandwiches – This sandwich is made with a super tasty, slightly spicy chickpea spread. It’s different, yet oh so good! 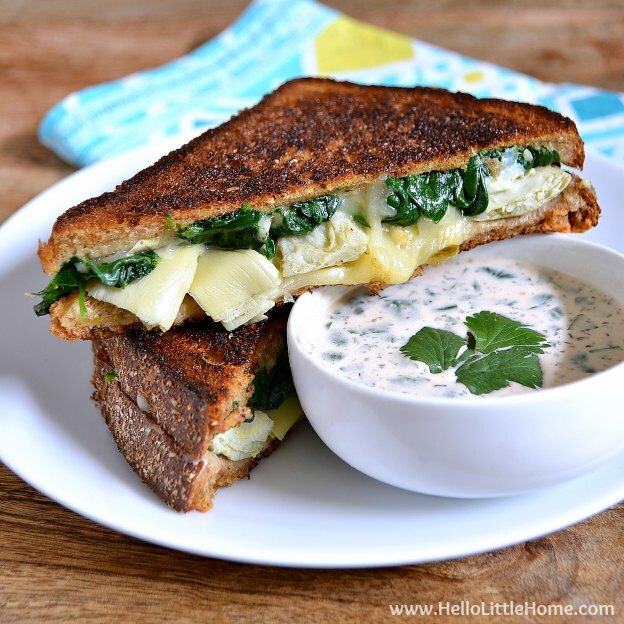 Spinach and Artichoke Grilled Cheese with Spicy Ranch Dipping Sauce – What’s better than grilled cheese? Grilled Cheese with ranch dipping sauce … yum, yum, yum! 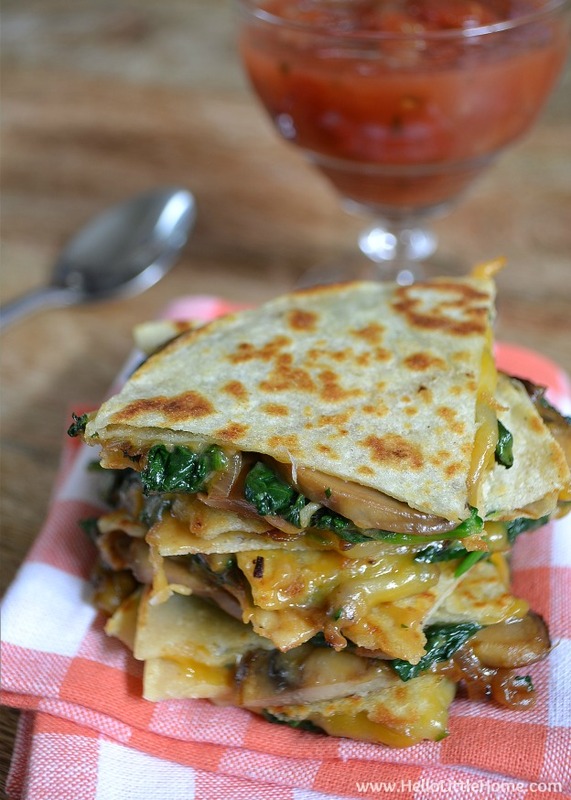 Garlicky Mushroom and Spinach Quesadillas – Serve these delicious quesadillas as an appetizer or for an easy weeknight dinner. 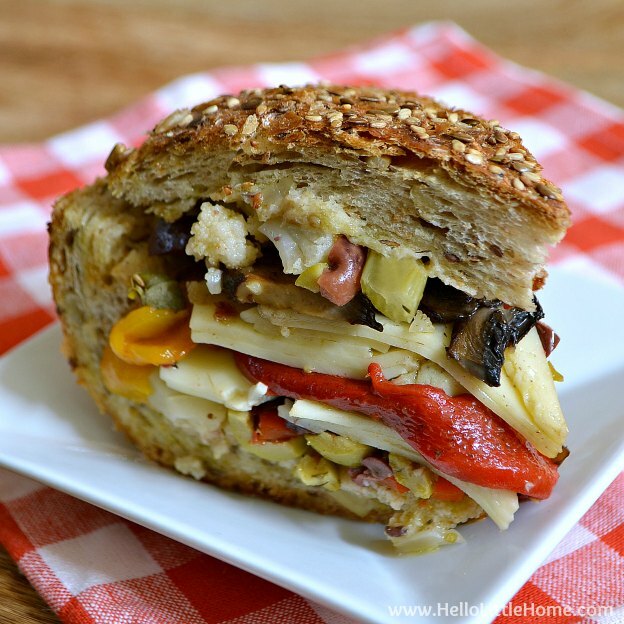 Vegetarian Muffaletta Sandwich – A veggie packed twist on the classic … perfect for picnics or any meal! 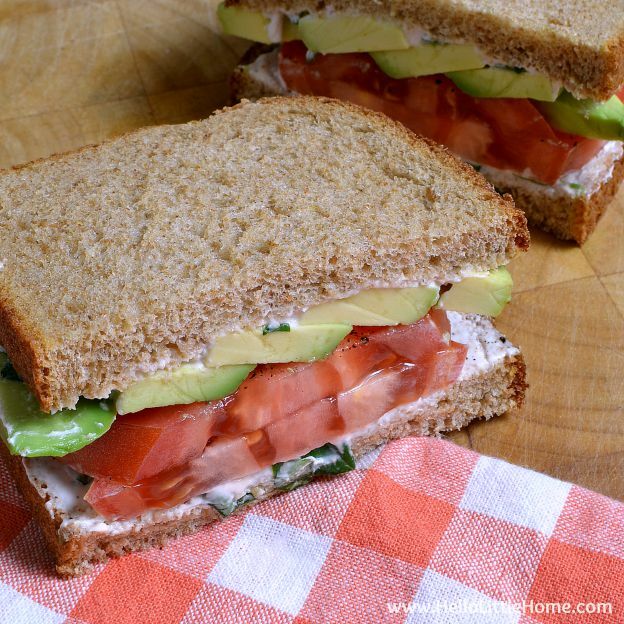 Tomato Avocado Sandwich with Creamy Yogurt Dressing – I love this light and easy to make sandwich. I’d eat this all year long, but it tastes even better in spring and summer! 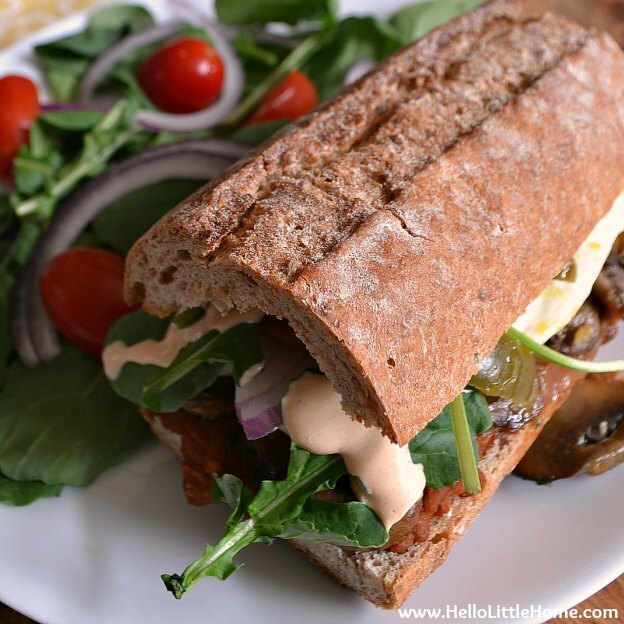 Garlicky Mushroom and Chipotle Refried Bean Tortas – These tasty sandwiches are perfect for a casual Cinco de Mayo dinner … or any meal! 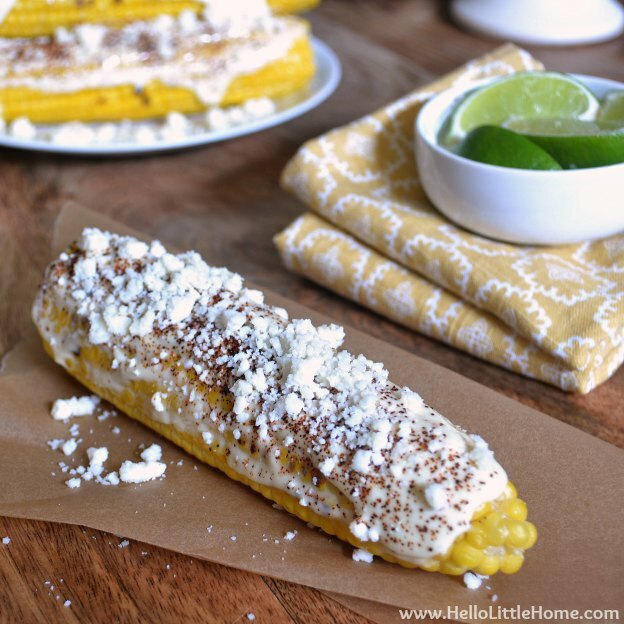 Elote, Mexican Grilled Corn – This is my favorite way to eat corn: creamy, messy, and full of flavor! 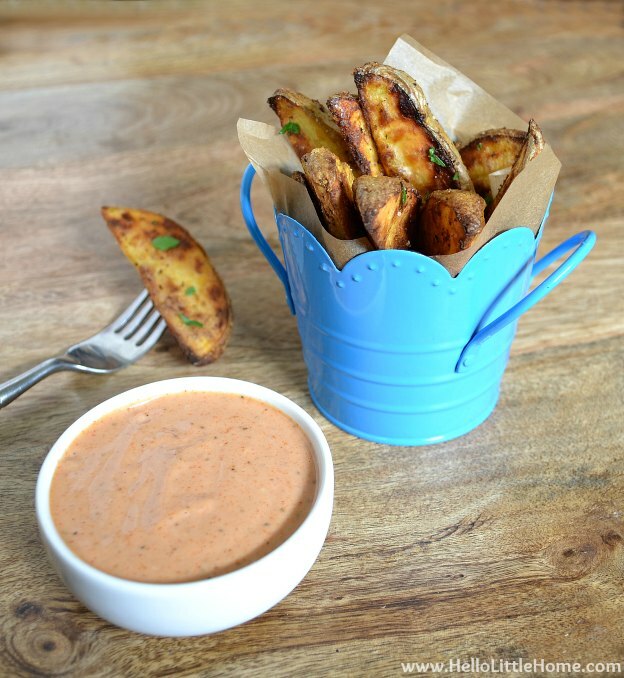 Old Bay Roasted Potato Wedges – Serve these delicious roasted potatoes next to all of your spring and summer meals. They come with a dipping sauce that is simple, yet oh so good! 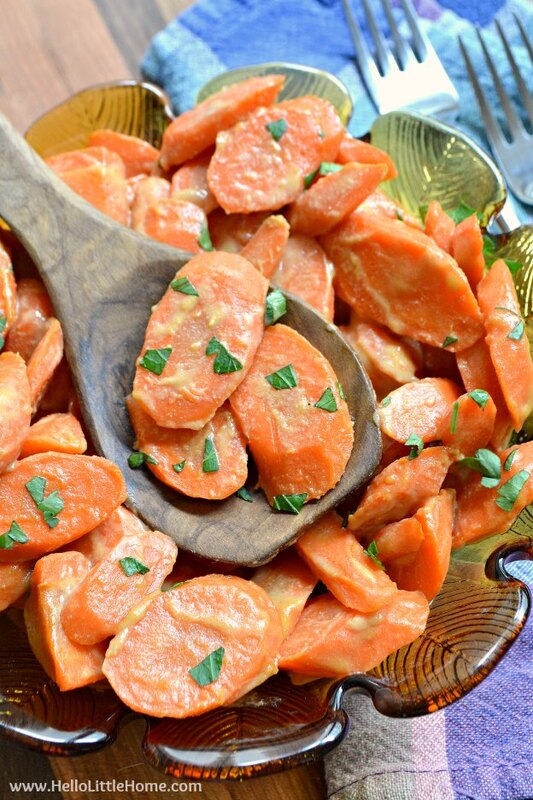 Dijon Brown Sugar Glazed Carrots – I’ve been making these flavor-filled carrots for years, and I never tire of this recipe! You’re going to love this simple side dish! 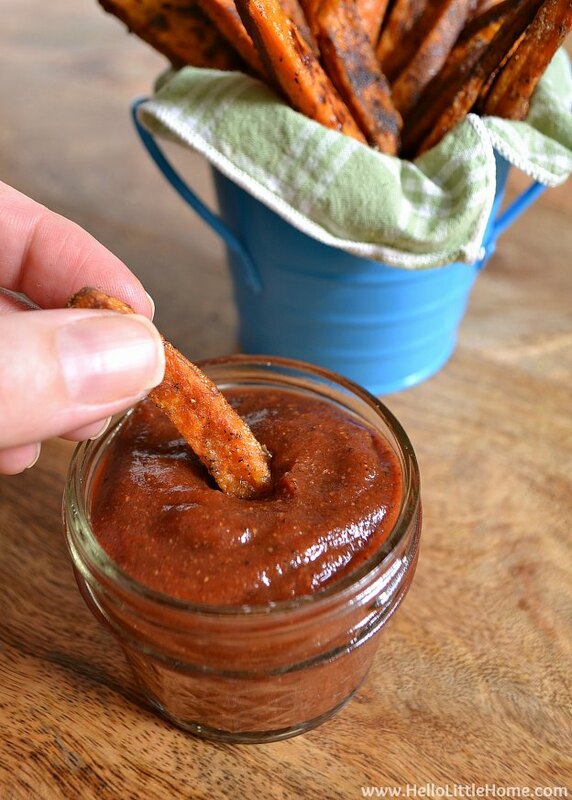 Roasted Sweet Potato Fries with Garam Masala Ketchup – Pair these delish fries with your fave veggie burger. 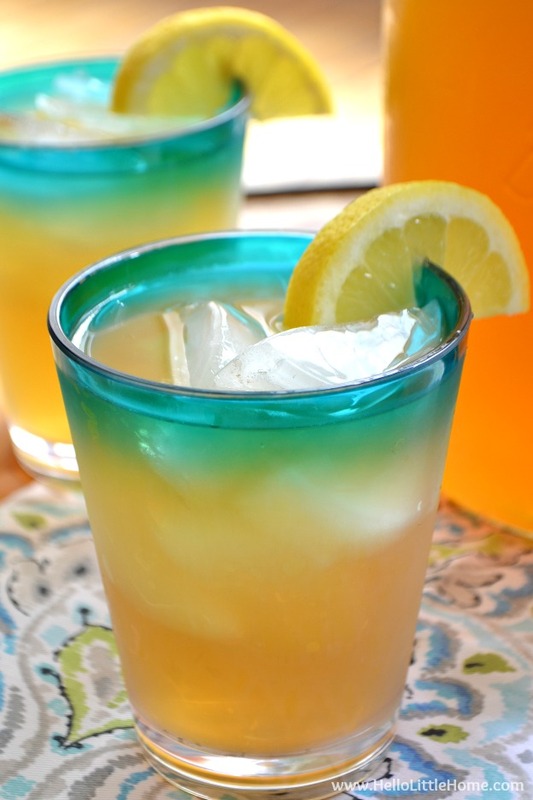 Iced Green Tea with Coconut Water – a refreshing, easy twist on classic iced tea. 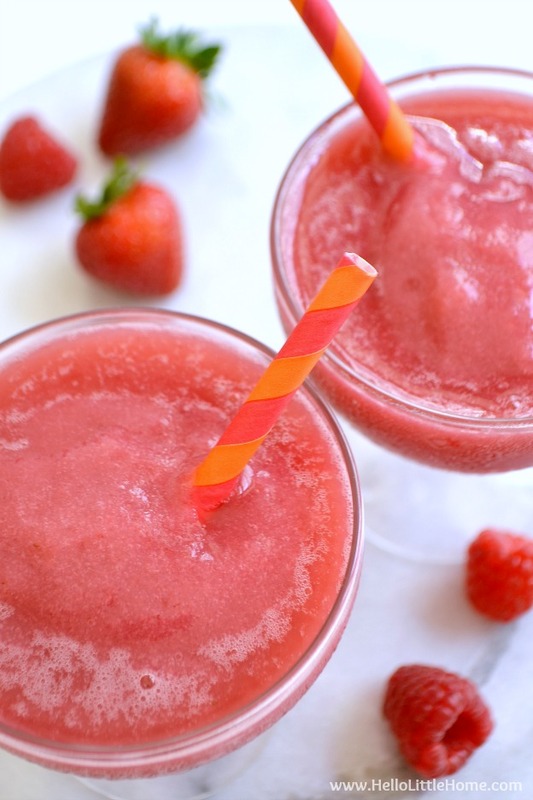 Frozen Strawberry Rose Slushie – Celebrate spring’s arrival with a fun, frost Frose! 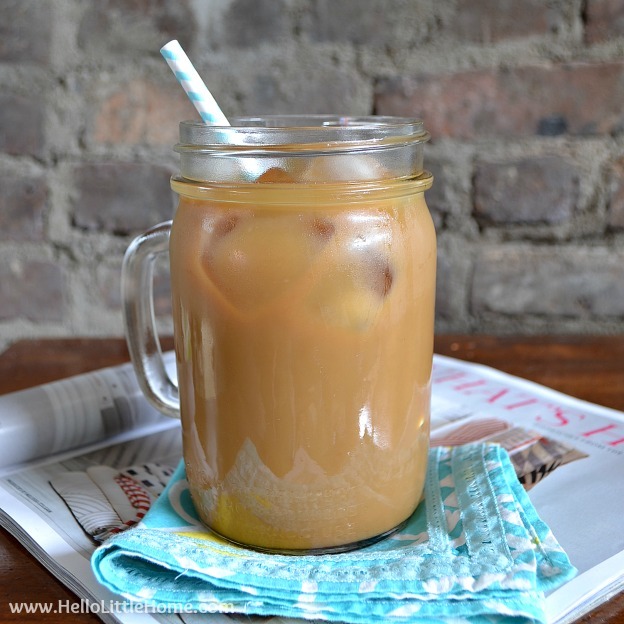 How to Make the Perfect Iced Coffee – I drink iced coffee all year round, but it’s especially good as the weather starts to warm up. This is my go to recipe. 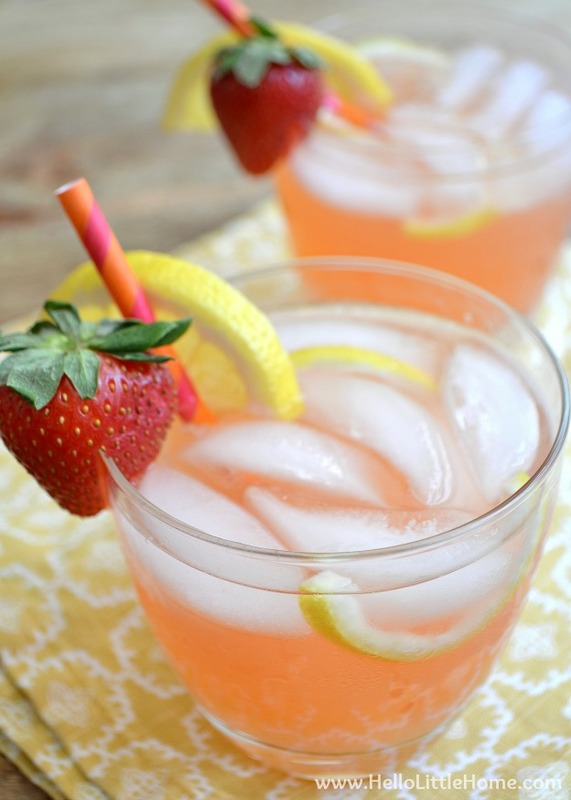 Strawberry Lemonade – This is the BEST strawberry lemonade … the perfect balance of sweet and tart! 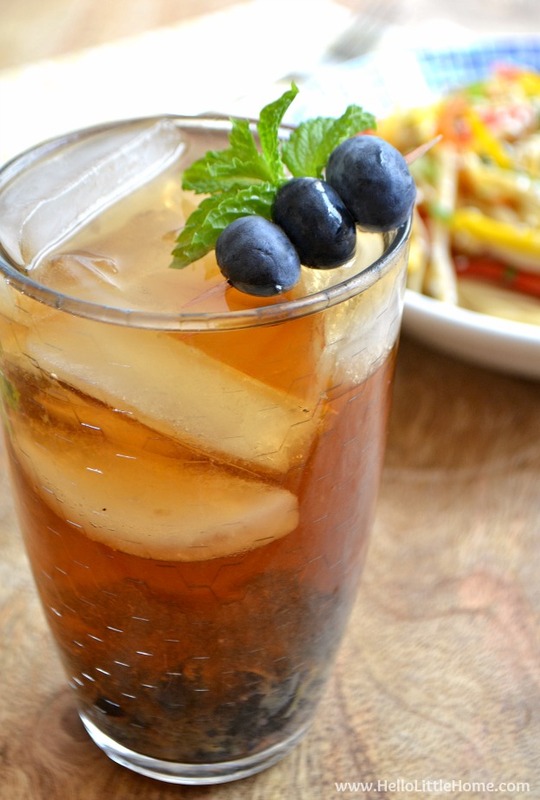 Blueberry Mint Sweet Tea – This refreshing sweet tea is super simple to make and pairs great with any meal. 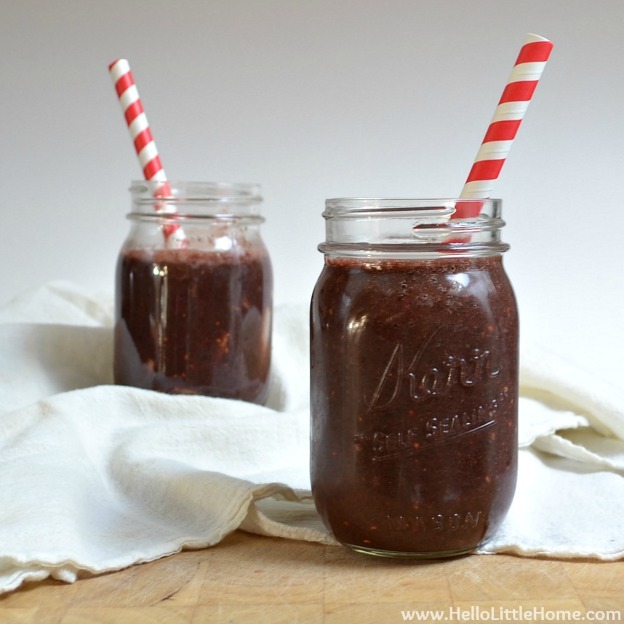 Berry Green Smoothie Recipe – Treat yourself to this delicious and healthy drink, and your morning will be instantly improved! 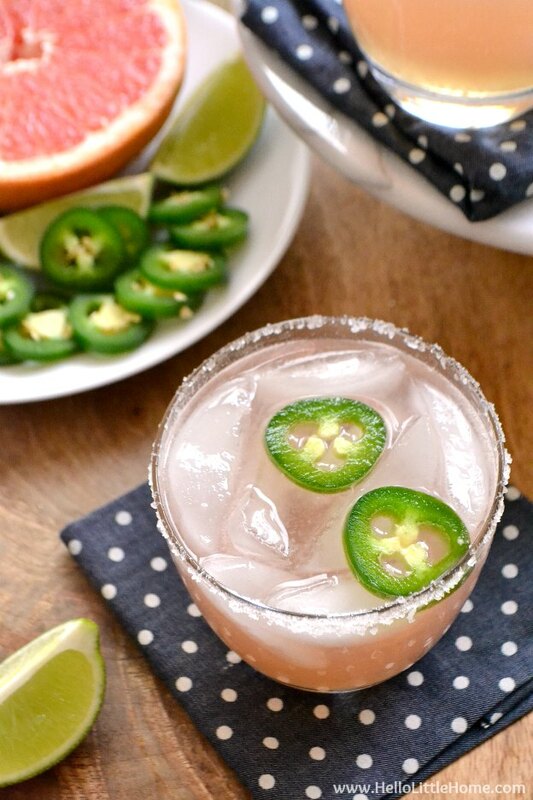 Spicy Paloma Cocktail – The perfect cocktail for Cinco de Mayo or any festive occasion. 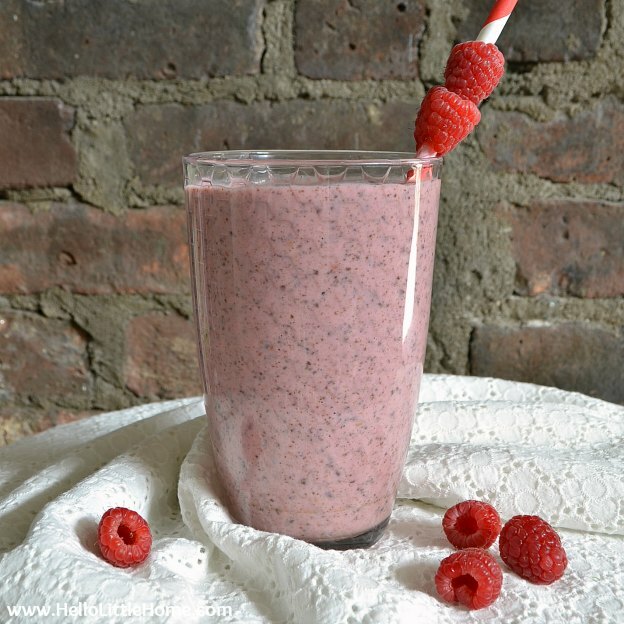 Raspberry Chocoholic Smoothie Recipe – This smoothie tastes decadent, but it’s actually pretty healthy … the perfect spring treat! 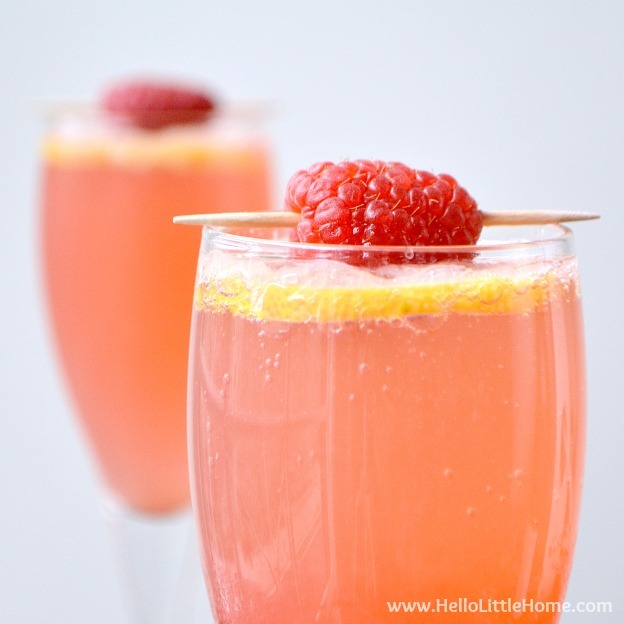 Raspberry French 75 – Cheers! I celebrated my most recent birthday with this fun and festive twist on the classic cocktail. 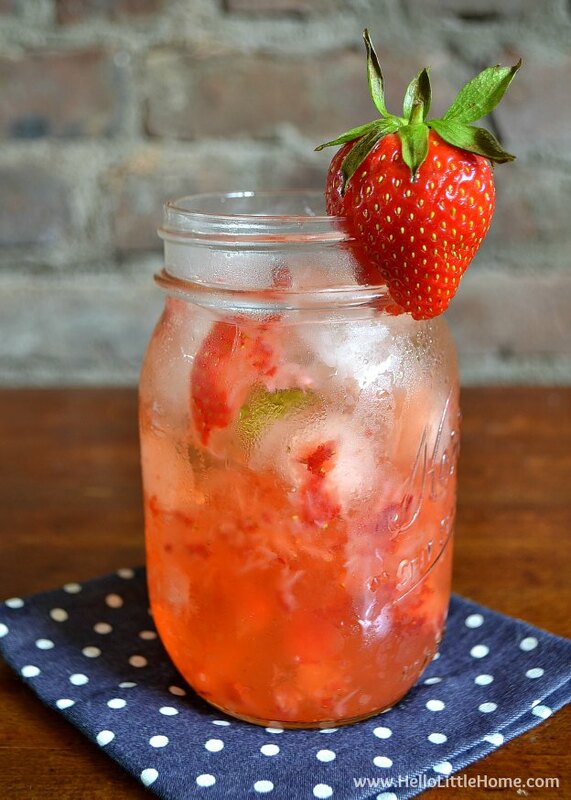 Strawberry Mint Gin and Tonic – I LOVE a good gin and tonic, so naturally, I had to put my own twist on one! 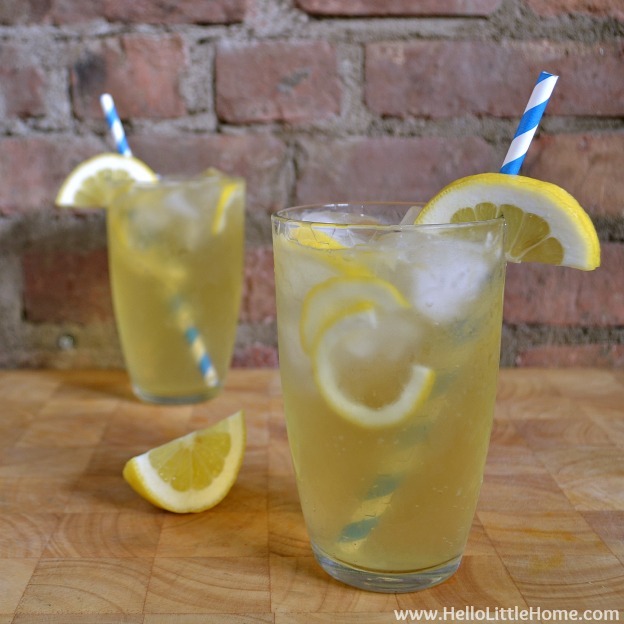 Lemonade Shandy – Make this refreshing drink to enjoy on a warm spring evening. 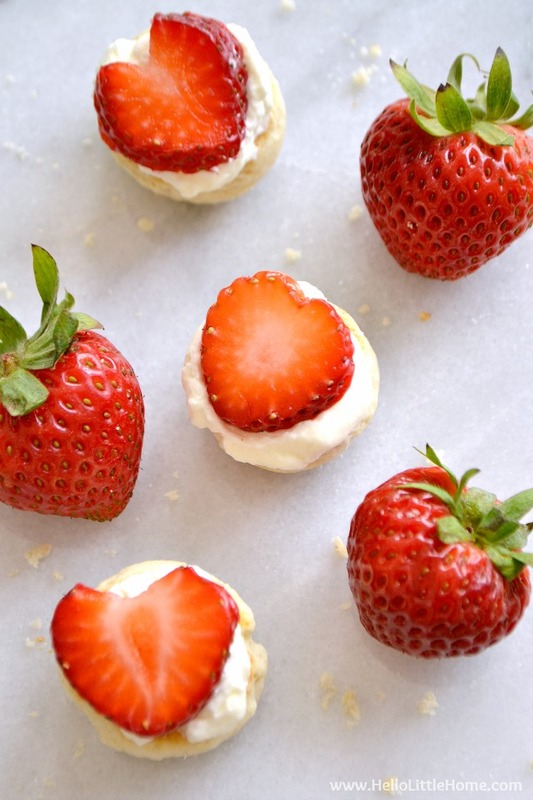 Mini Strawberry Shortcakes – The cutest, most delicious spring dessert … perfect for Easter brunch or a party! 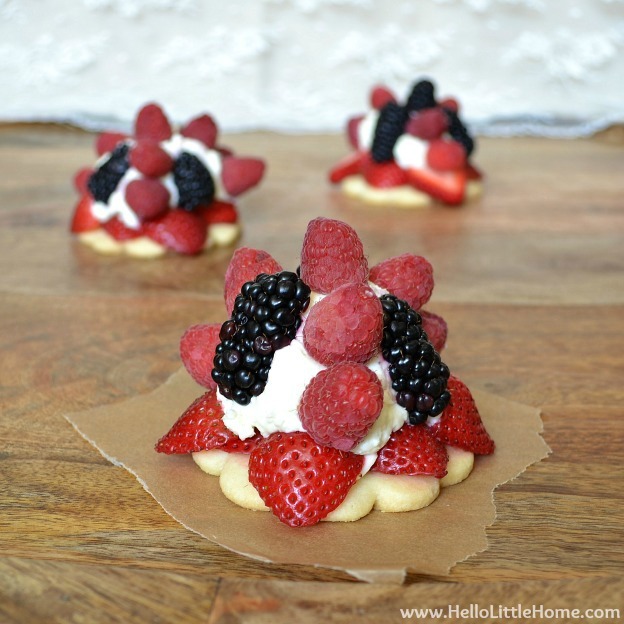 Berry Cream Tarts – Yum! These cute tarts have it all … they’re fresh-tasting, sweet, and creamy. They’d be perfect for serving at spring luncheon or dinner. 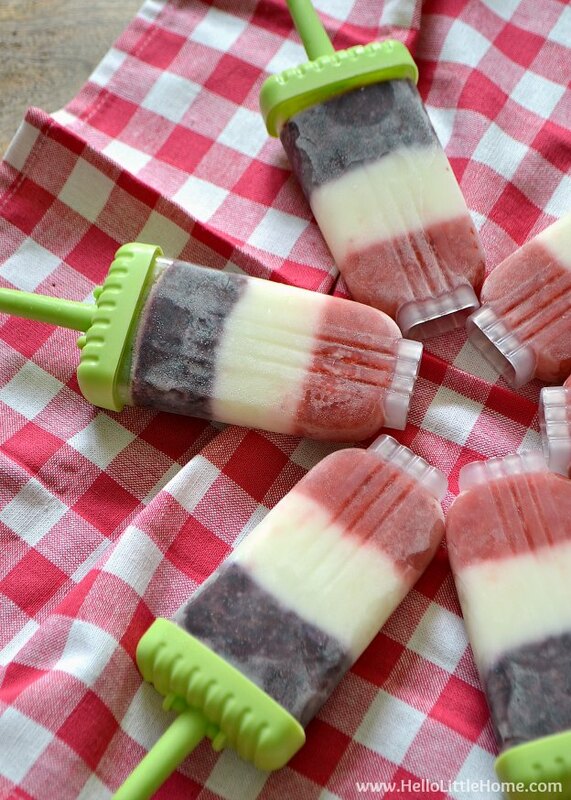 Easy 4-Ingredient Red, White, and Blue Popsicles – Kick off the season with these festive popsicles. They’re so simple to make and would be perfect for your Memorial Day festivies! 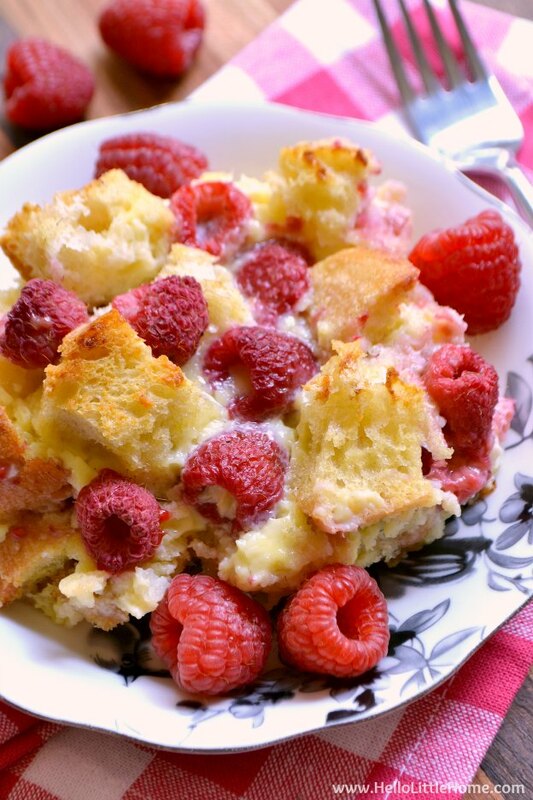 Raspberry White Chocolate Bread Pudding – Seasonal berries make this easy recipe an ideal treat … try it for Easter brunch! 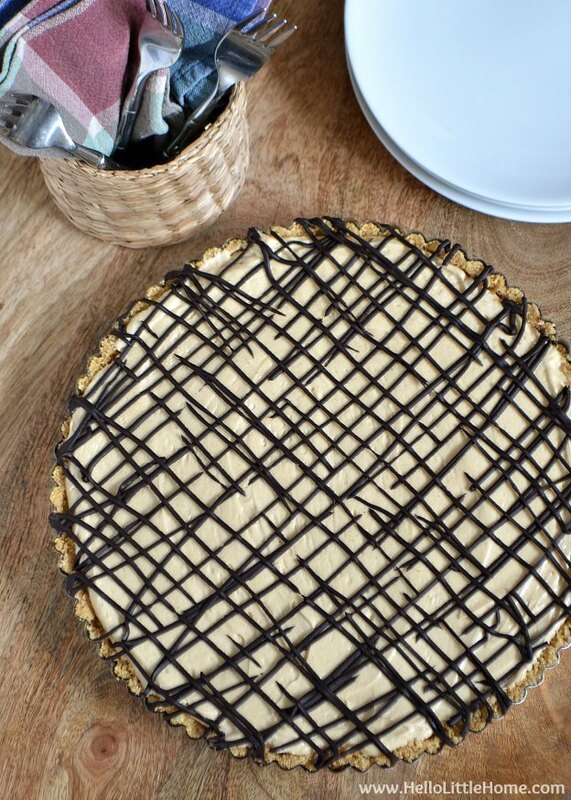 Creamy Peanut Butter Tart – This no bake recipe is a wonderful combination of everyone’s favorites: peanut butter and chocolate … yum! 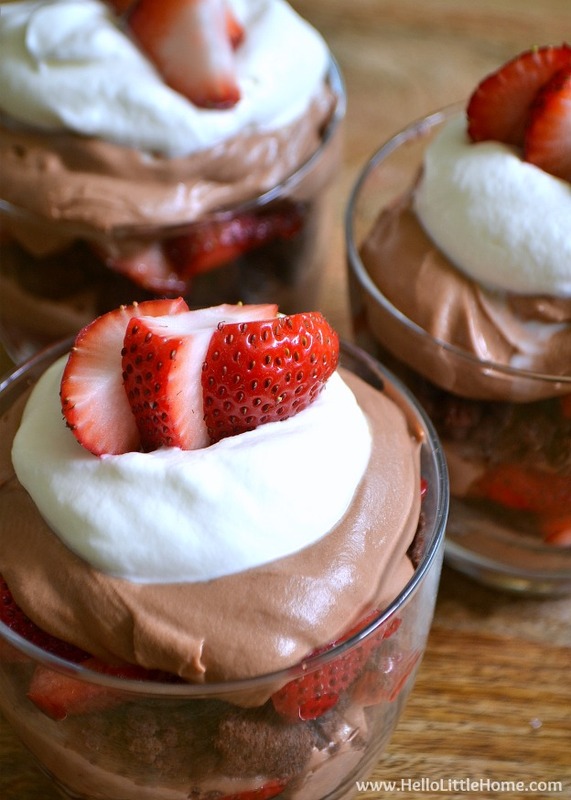 Chocolate Covered Strawberry Parfaits – Totally decadent and super delicious, these yummy parfaits are an amazing spring treat. 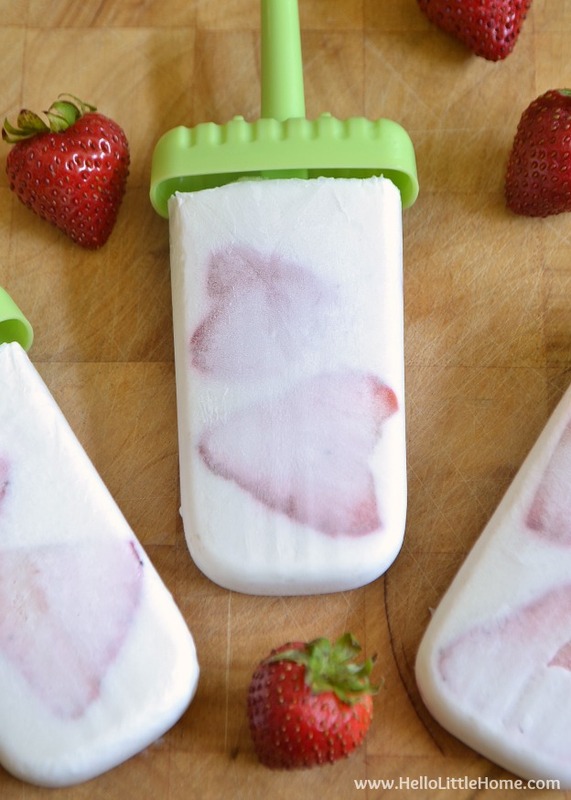 Strawberry Coconut Paletas – The perfect sweet treat for a warm spring day! 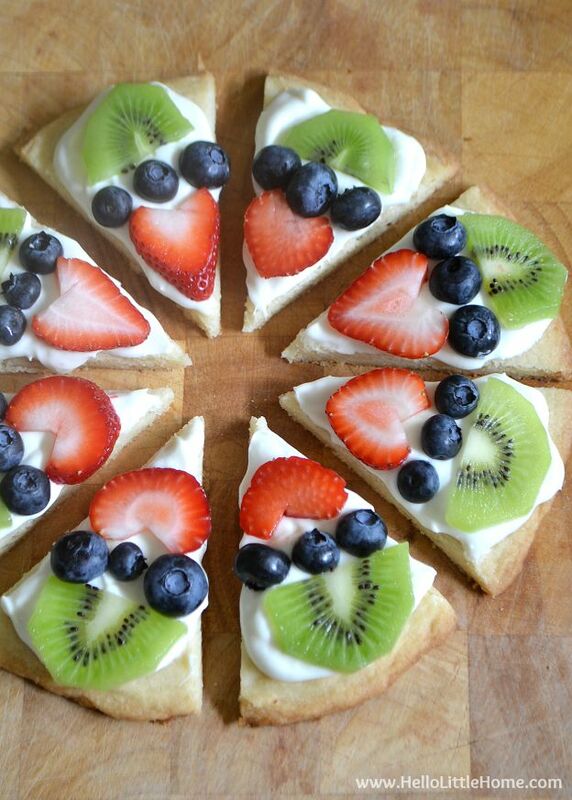 Mini Fruit Pizza Cookies – These bite-sized cookies couldn’t be much cuter, and they taste just as amazing as they look! 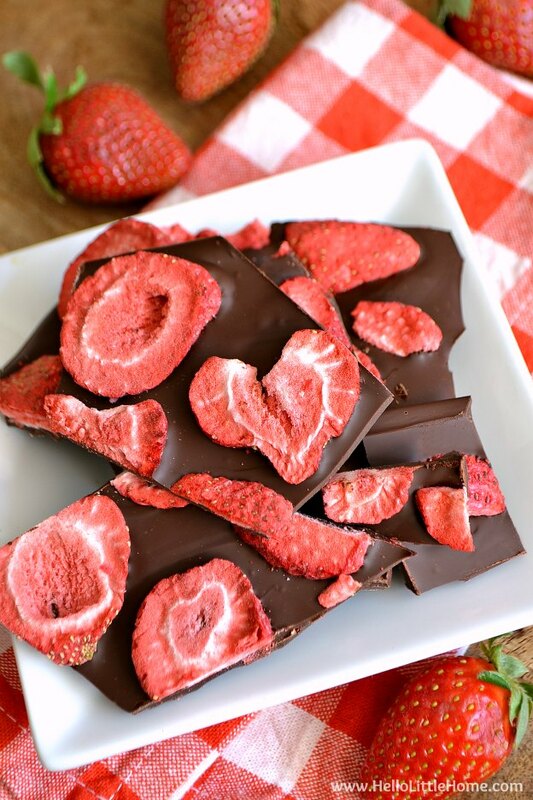 Strawberry Dark Chocolate Bark – This bark is an easy to make treat that’s a wonderful sweet gift … or keep it for yourself! Old-Fashioned Rhubarb Cake – This recipe was taken straight from my grandmother’s cookbook, and it’s amazing! 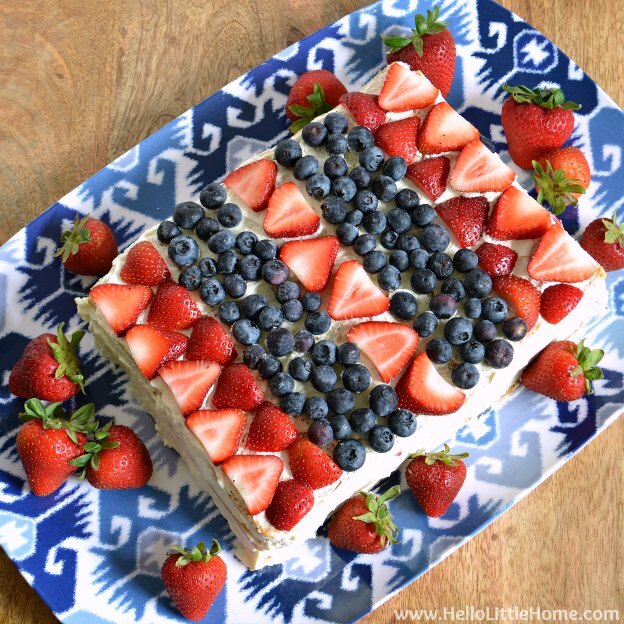 Easy Red, White, and Blue Icebox Cake – So delicious … serve it for Memorial Day! 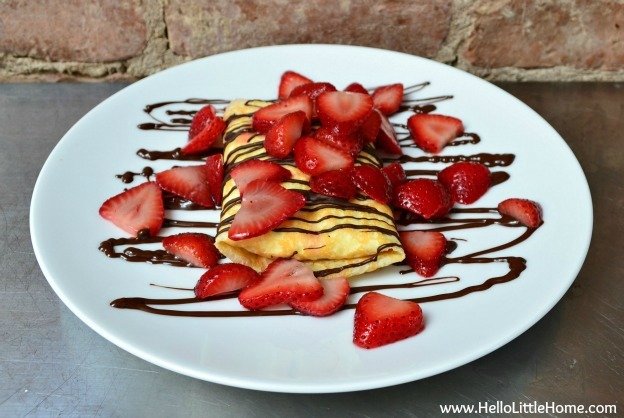 Strawberries and Cream Crepes with Chocolate Sauce – Another favorite recipe of mine! Serve it for a special occasion or any time you want to treat yourself. 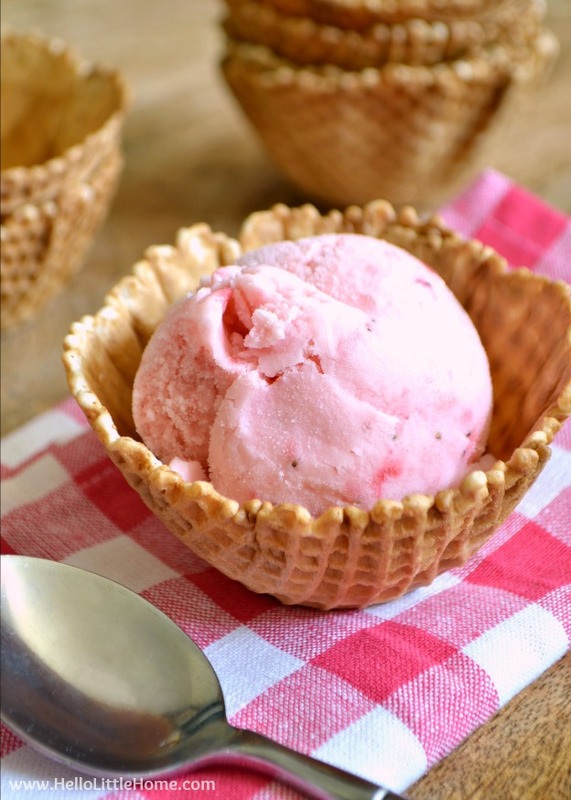 Strawberry Frozen Yogurt – This delicious, berry-filled froyo only takes four ingredients to make, yet it’s so good. You’ll want to enjoy it all spring and summer long! 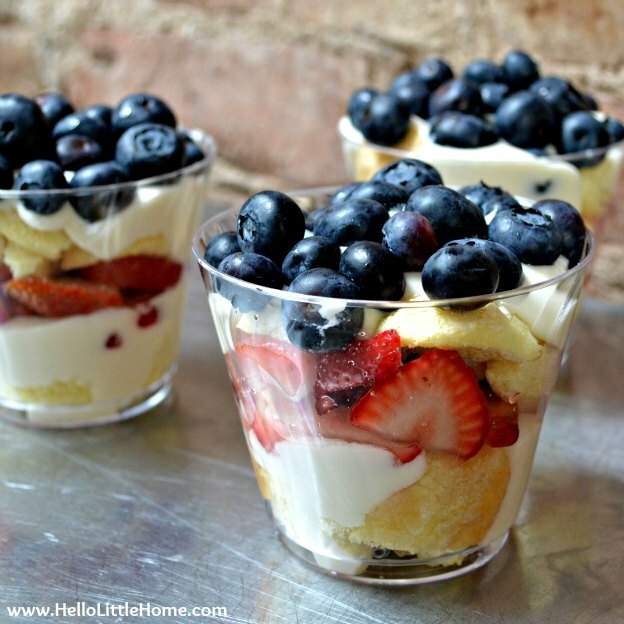 Individual Red, White, and Blue Trifles – These mini trifles are easy to make and super delish … perfect for Memorial day or any occasion. 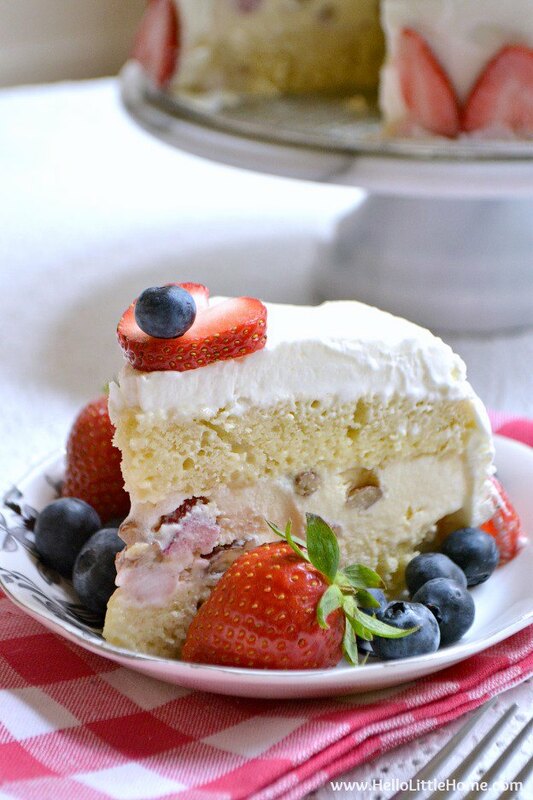 Strawberry Pecan Ice Cream Cake – Serve this mouthwatering cake for a special occasion! What are your favorite vegetarian spring recipes?